There is something rather special about hearing the letter box clap shut and the foot steps of the postman (or woman) tapping along the path. A dog may bark, if you have one, or the little ones may excitedly run down the hall way, if you have any, especially if it is their birthday. Receiving a message the old fashioned way, hand written on a lovely piece of notepaper, sealed in an envelop and adorned with a stamp, can never be replaced by an electronic note popping up on our devices – even though we nearly all have them. And as much as I would love to send you all a hand written letter, we all know that it is just not going to happen, so please accept my apologies now as I send this letter to you across the ether. Dear All, I just want to let you know that I have been writing a blog for the past few weeks, but have kept it a bit of a secret – just until I got the hang of it. As it likely to be a while before I truly get the hang of it and understand how it all works I decided it was time to contact you anyway; but please be patient with me as all may not run smoothly. 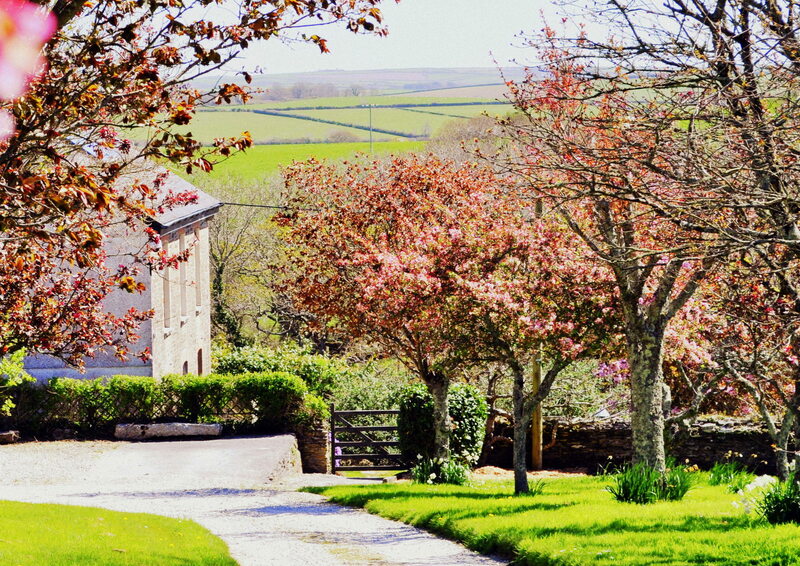 I write from my home in Cornwall. When I say Cornwall I mean, more specifically, that I write from the outskirts of the delightful Cornish harbour town of Fowey. Rolling hills and fields surround us with the coast a short walk away. 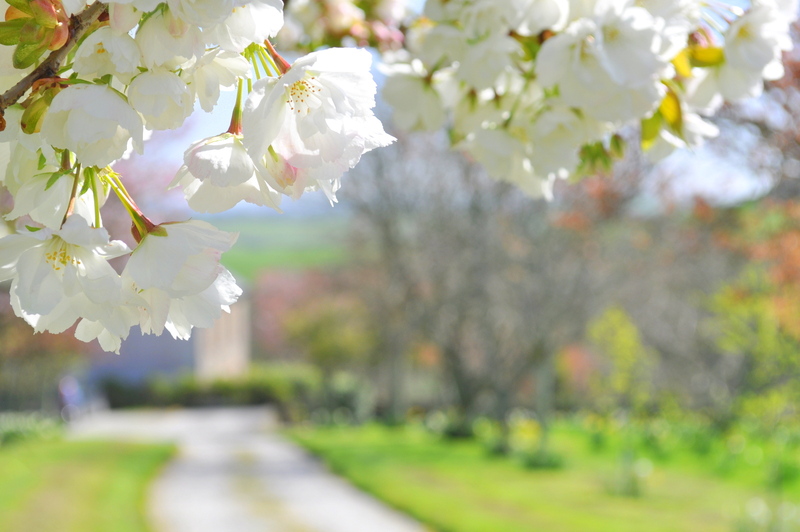 Birds softly sing from the surrounding trees and the rumbling of tractors pass the top of our drive. In the summertime, when the schools close for the holidays, we open up our sizeable front garden to campers in tents, motorhomes and caravans, www.polglaze.co.uk. The tranquillity gives way to happy chuckles of children playing ball, sizzling of sausages over the barbecues, clanking of glasses and sometimes popping corks. 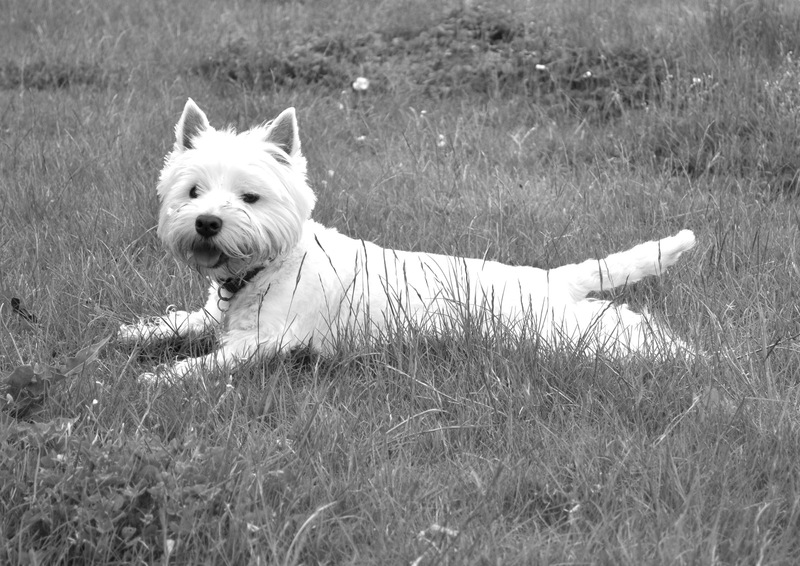 It is a very busy time of the year for us and a very sociable one too – we are all happy when we are on holiday. I love holidays and I love to see the joy of those on holiday too! Fowey has such a lot to offer that I am going to tell you about its charm another day soon. 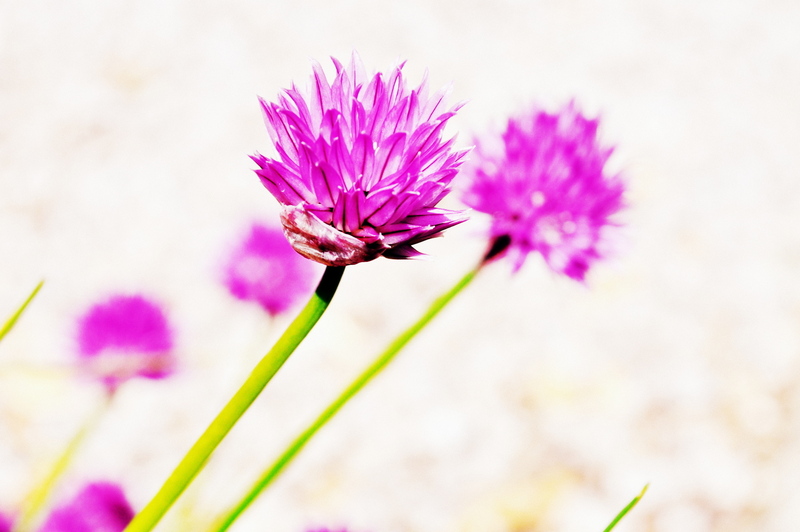 Today I simply want to share with you what I have been up to on my blog so far. 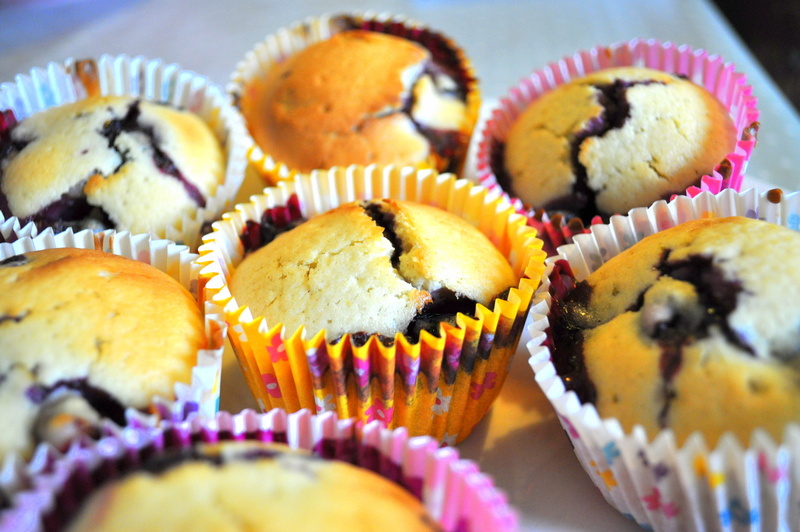 I have been writing about my sweet bakes and all the things with relevance to them. I have penned tales of days out and holidays of those where I feel you might like to visit too. You will find bits on art and design matters; pattern in the environment; photography; and creating things for the home and to give. There have been patterns in a zoo, harbour and café, at home in the sun, pictures in the garden and big feet at the beach. I have shared my recipes for the most indulgent chocolate brownies; succulent orange and chocolate cake; cappuccino and walnut cake; strawberry, lime and cream sponge, mini tartes a la creme and raspberry and white chocolate cheesecake. 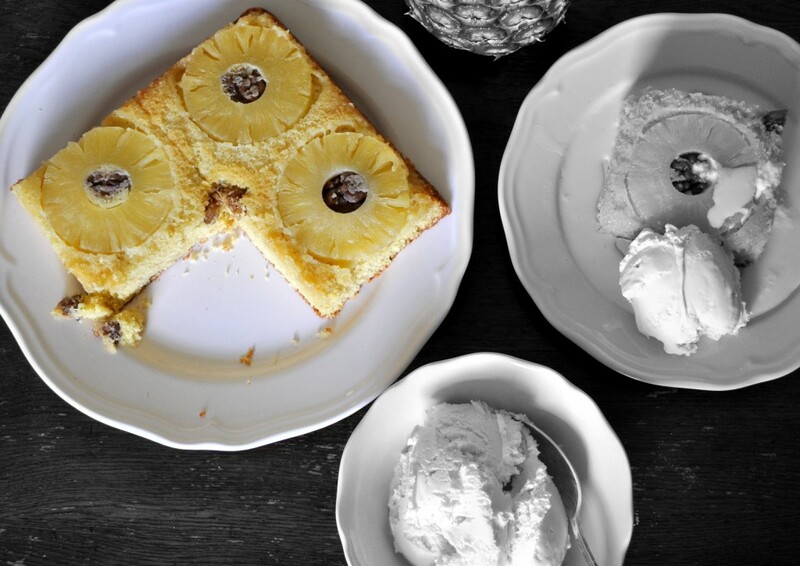 My next recipe will be pineapple and walnut upside down cake with coconut ice cream. 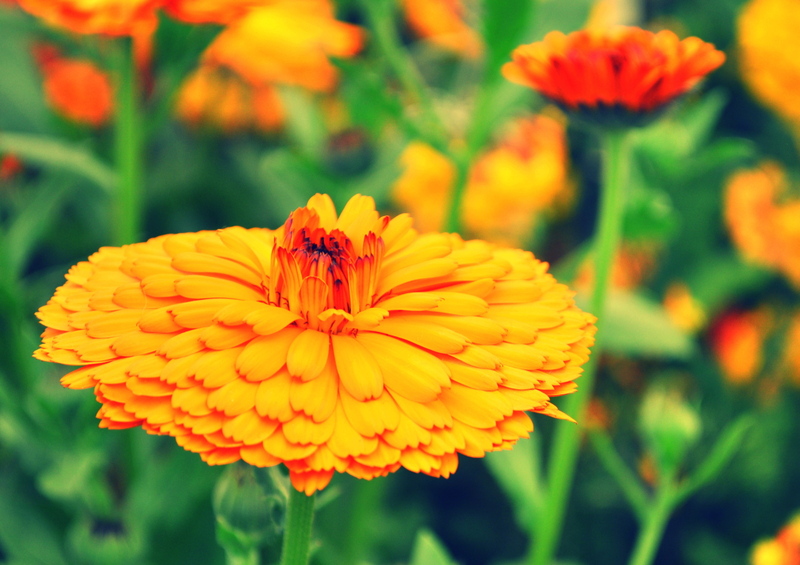 Colour is a topical issue in the home and dazzling orange is one of the first off the starting line. Lemon prints can be found amongst the pages too. One of my daughters is called Clementine, as some of you know. She has always wondered why I chose to name her after a citrus fruit? It was not because I love to eat citrus fruits, even though I enjoy baking with them, but simply that my husband and I thought it a lovely name. On the subject of fruit I recently had the urge to paint strawberries even though, as some of you will already know, I can’t eat them – find out more in Strawberry Art. 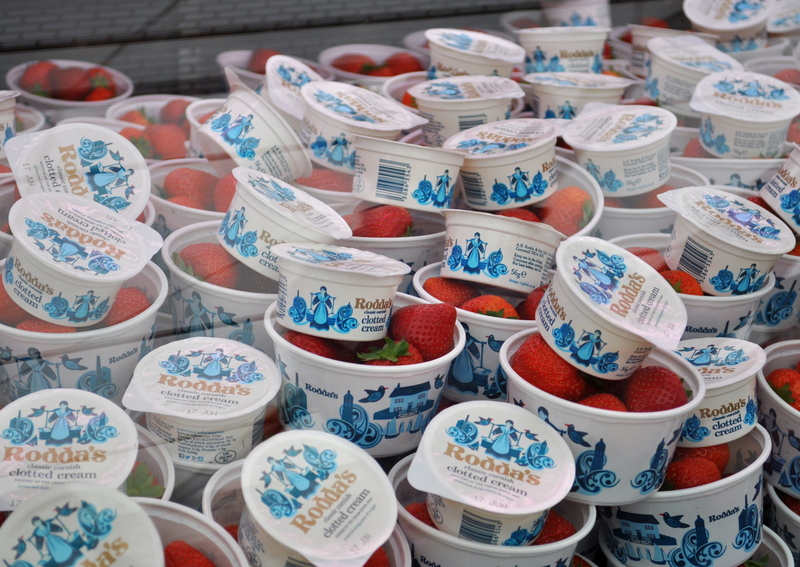 There were mounds of luscious strawberries at the recent Royal Cornwall Show that I was lucky enough to attend and write about. It takes place every June. I hope on reading all about it here that some of you may be tempted to visit next year. 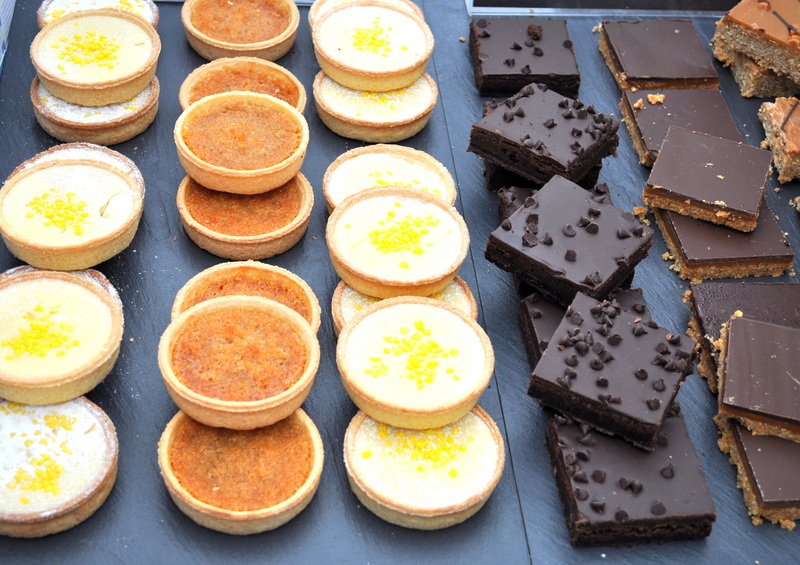 I don’t yet know how things will progress at pictures and patisserie, but I do hope that you join in and let me know if there is anything you would like me to cover, advise on or a sweet recipe you might like to make. There are plans to feature artists and their work just as a gallery would. And I hope to take you through my own artistic progress. But for now I say goodbye, but I hope to hear from you in the near future. You will certainly be hearing from me very soon and on a regular basis.. 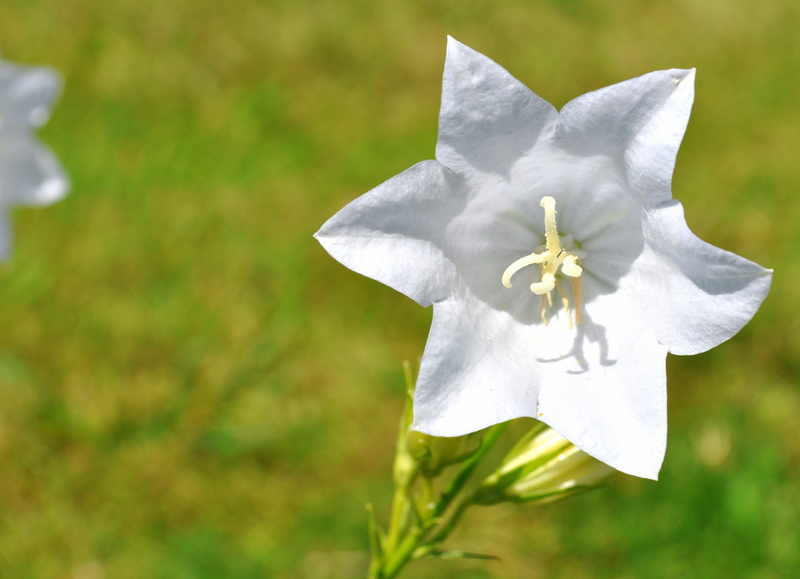 Some blooms from around the garden from early spring until present day. 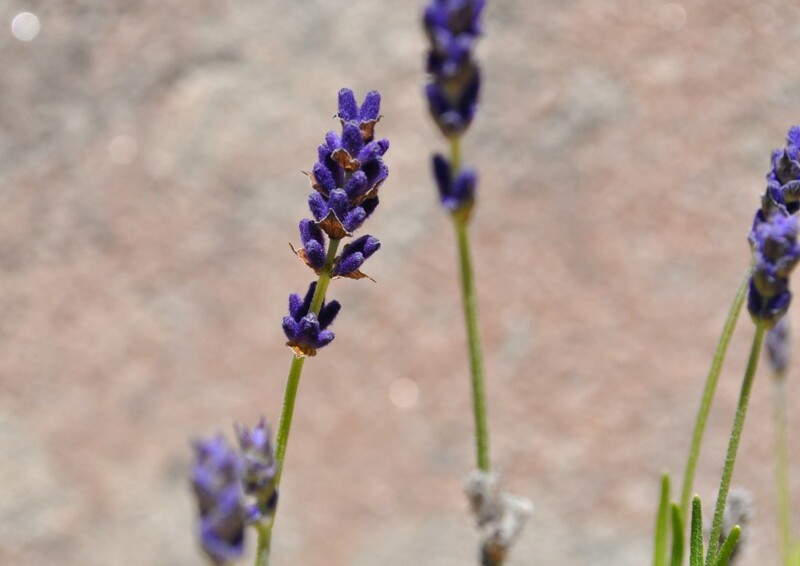 The lovely pink blossom has since given way to growing fruit and the lavender is just beginning to flower attracting the bees and dispersing its lovely perfume. The beach scene is that of Polkerris which is just a walk away. Many a happy hour or two have been spent there; either on the beach or in the water, or at one of the two places to eat: The Rashleigh Inn and Sams on the Beach. Both are delightful with great menus and fantastic views out to sea. 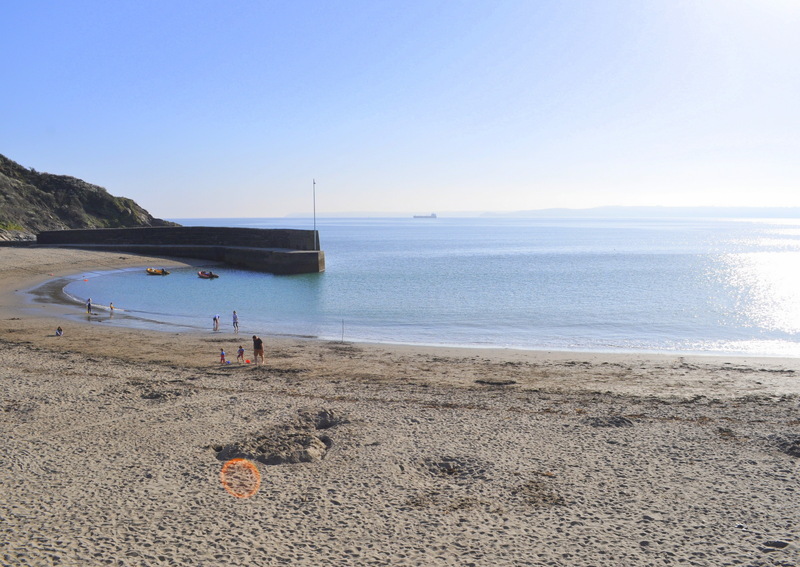 Polkerris also has a water sport school, gallery and café. Enough there to keep everyone satisfied! 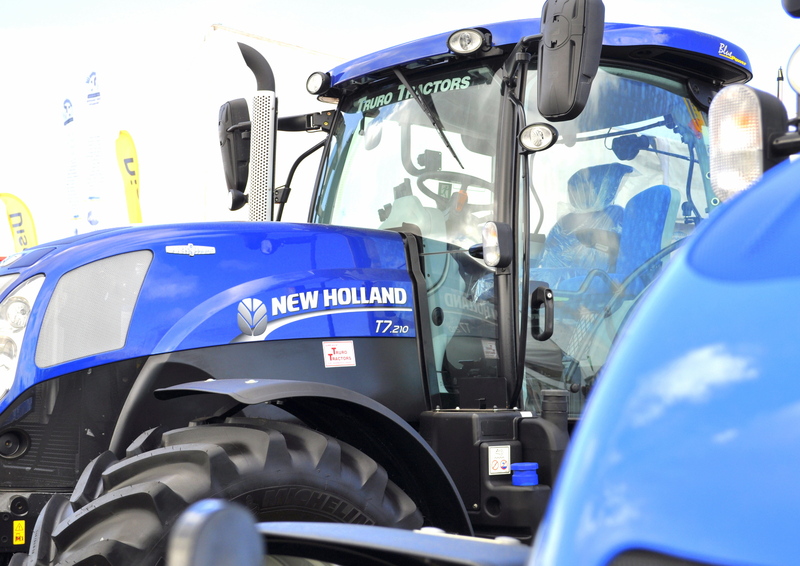 Every year it happens and some years I manage to make it there: The Royal Cornwall Show is Cornwall’s biggest annual event. 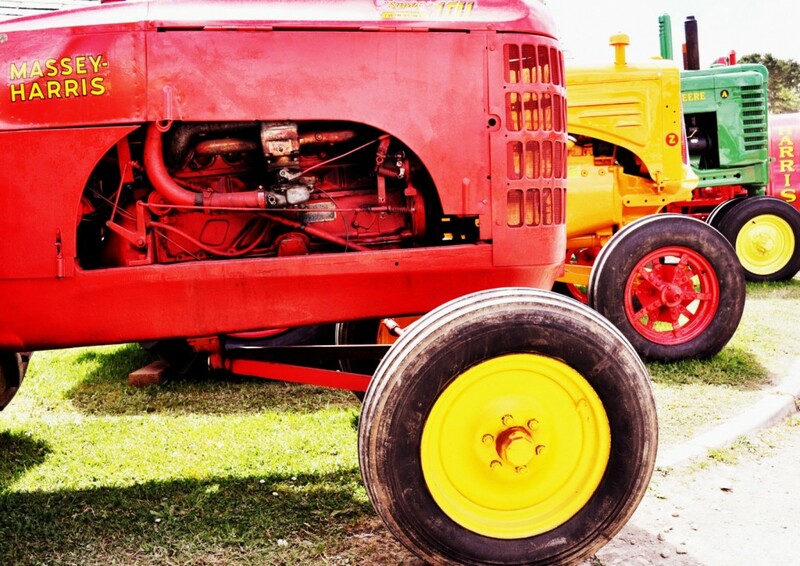 It was once a show for farmers, but the economy dictated that it become an agricultural show for the general public. 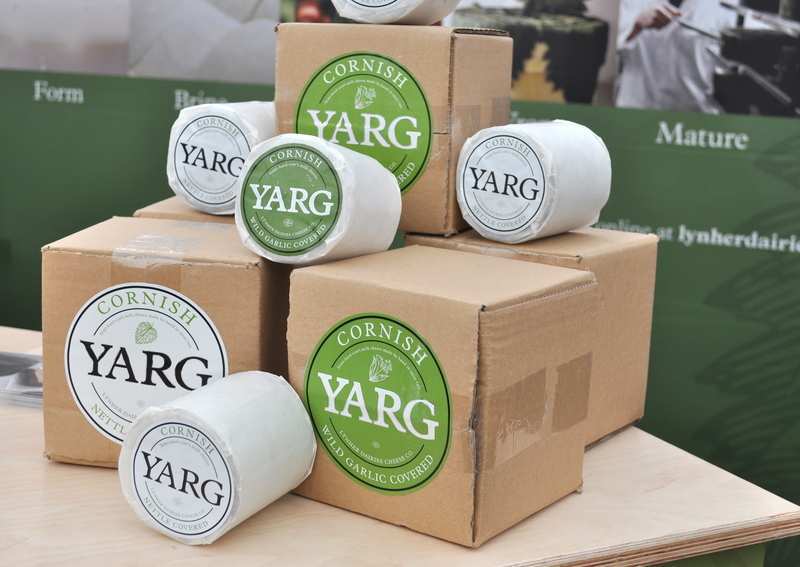 It is organised by The Royal Cornwall Agricultural Association and has been held at the showground at Wadebridge, North Cornwall since 1960. The show has actually been going since 1793 and known as Royal since 1858. The wellies are still worn, more for fashion than practicality; and tractors still have a presence, but more so to entertain the little ones than farm the land. There is now something for everyone. 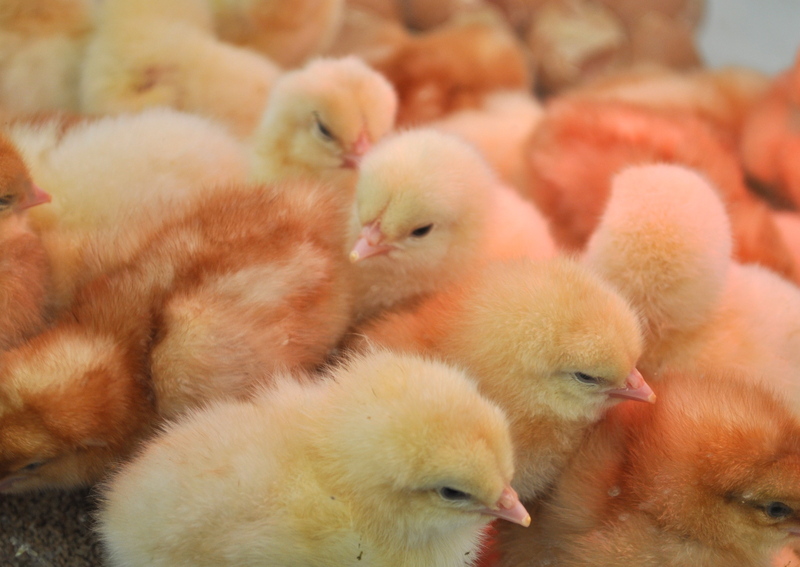 The food hall has expanded; shopping marquees have sprung up; there are dog shows, rabbit and poultry competitions as well as those for large livestock; a flower show; and a fun fair with candy floss and cuddly toys. Despite the commercialisation the Show is still quintessentially an occasion for farmers and country folk. The tweed jackets, Barbour coats and Hunter wellington boots remain strongly the dress code. Very befitting of its association with royalty and regular visitor Prince Charles, who is a keen supporter of farming communities. 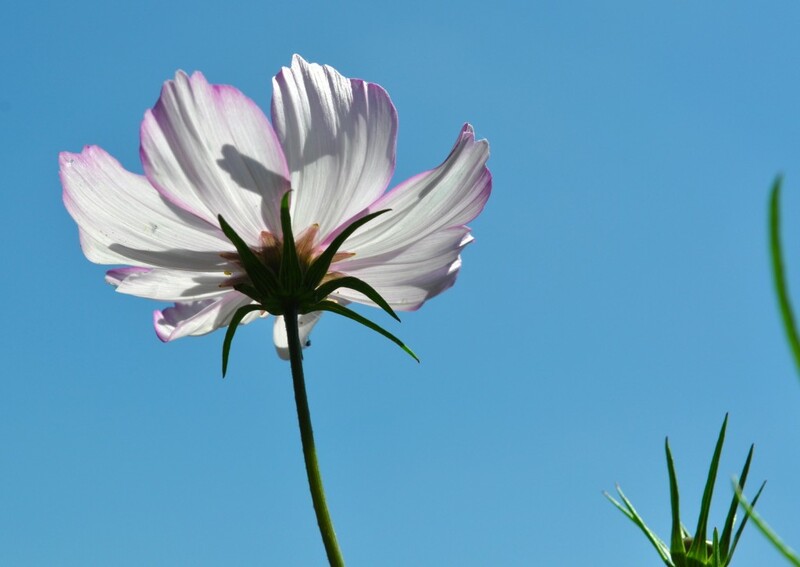 It is always held at the beginning of June, just when the weather should be bright and warm and the days longer. Unfortunately, it being England, the weather can be unpredictable and woolly jumpers, raincoats and wellies are sometimes the order of the day; not in 2015 though. The sun did shine and the rain stayed away, but there was a chilly north east wind to remind us that summer had not quite arrived. This was no deterrent. On the Saturday when we were there, so were most of Cornwall! The gates open at 7am, but only for the privileged few; otherwise the ticket office opens at 8.30. We arrived at 8.50 and, whilst the fields were already lined with vehicles, we did not have to queue. A very different story was told by midday when there was queuing everywhere, so the moral of this story is ‘get there early’. Old tractors and new must be the starting point of an agricultural show, especially for the men. Even for me though, I do feel a great deal of nostalgia in the colours and designs of the vintage vehicles. Modern versions may be faster, sleeker and more efficient, but I believe they do fit more readily in a sci-fi film than on the field. 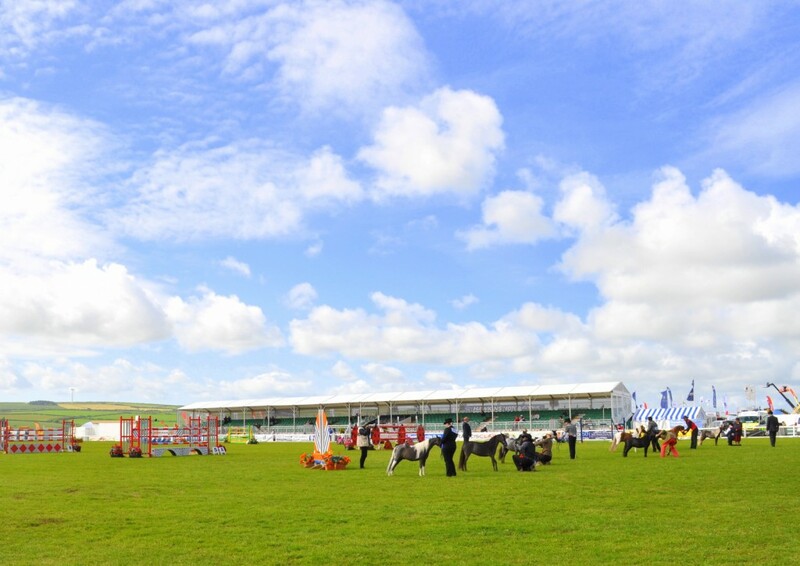 Before I move onto the Show that appeals most to me, we must not forget its origin as a show ground for animals, horse eventing and farming the land. I did want to share with you pictures of some of the sizeable cattle that were parading, but the popularity of this event precluded me from elbowing my way through the crowds and shoot a bit of beef; shooting with a camera and the beef being cattle! I did manage to get close to some chicks hatching in the dairy tent and catch a glimpse of some horse trial, I say ‘some horse event’ because, in my ignorance, I know very little about horses and such activities . I would normally sample some of the local ciders, gin, creamy liqueurs and wines, but I decided it was wiser to keep a level head this time. But I did nibble at biscuits, brownies and cream, bread, cheese, pies and pate. Bread you can really taste at Vicky’s. 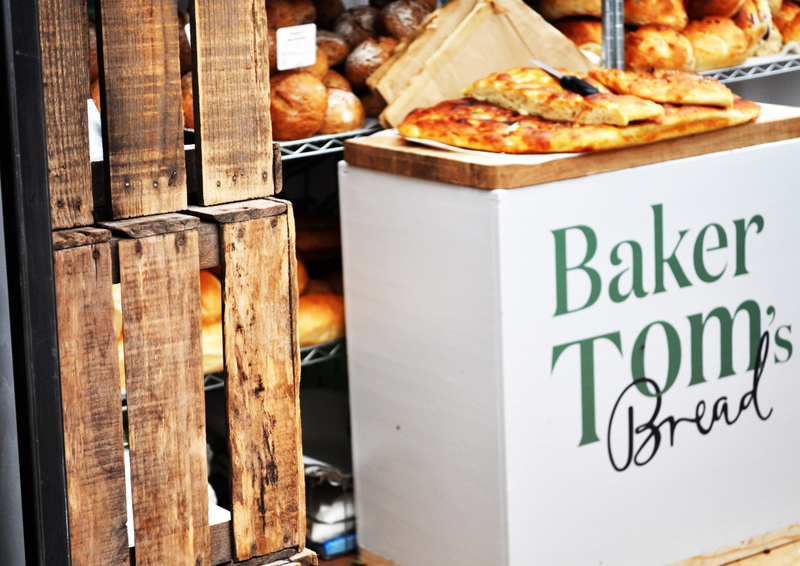 Fine artisan bakes and all handmade in Helston, Cornwall. 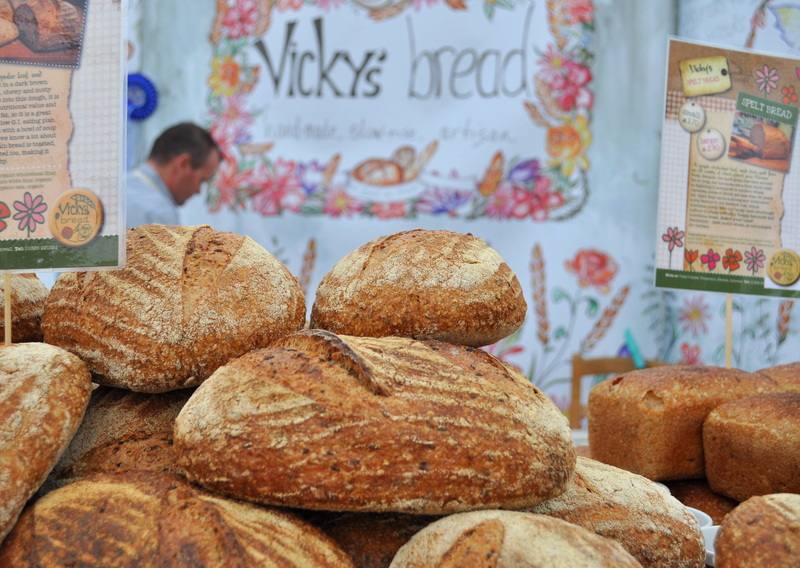 www.vickysbread.co.uk. I would strongly recommend that you take a look at Vicky’s website; it is quite a charming story that is told. With all this talk of bread, I can only think of cheese. 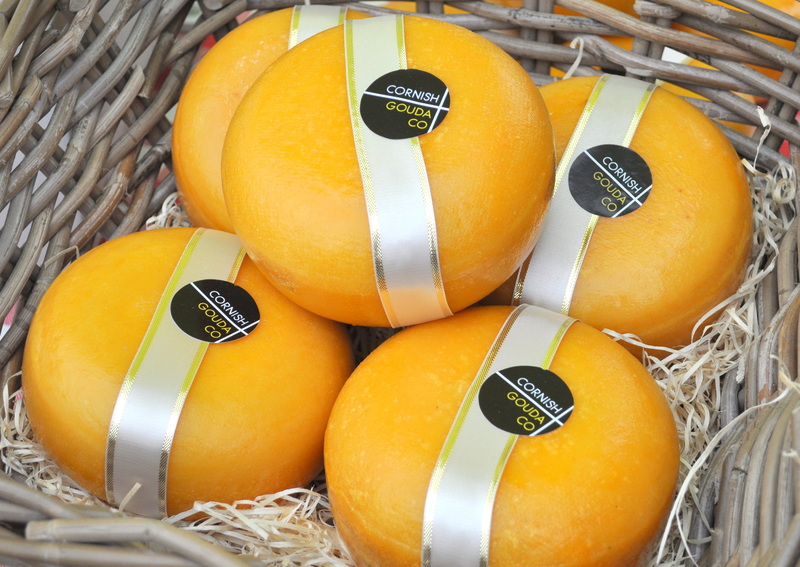 There is something very special, but very simple, about freshly baked bread and a wedge of quality, creamy cheese. 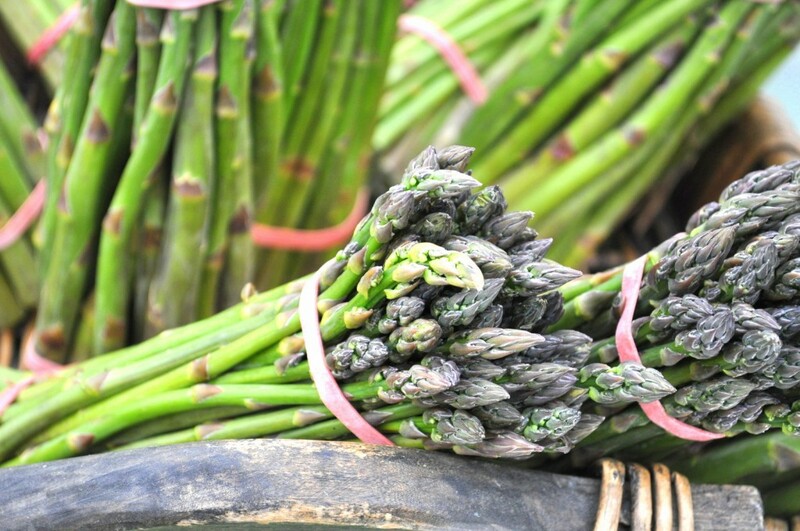 Just add a little homemade pickle and it is quality rustic food heaven. 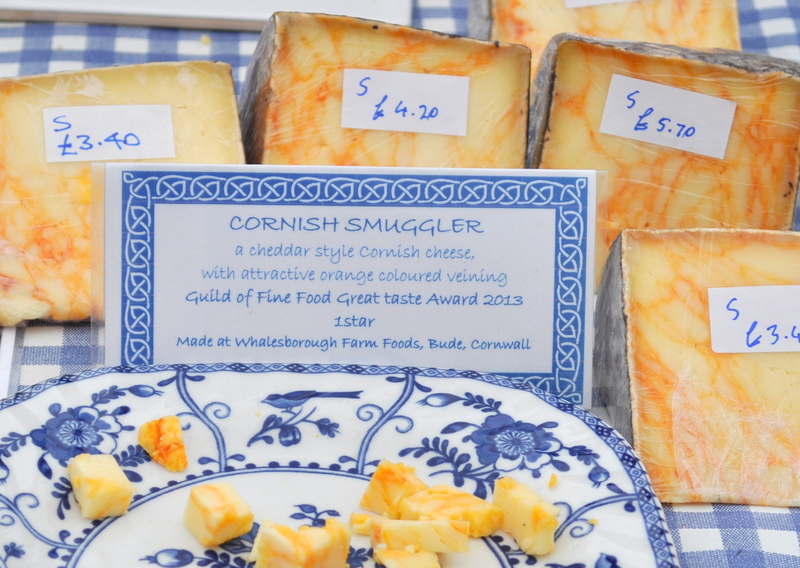 A cheese course followed by Cornish produced cream served with succulent strawberries. Unfortunately and tragically, I have an allergy to strawberries, so I just had to have scoops of cream with brownies instead, those brownies to be found at Baker Tom’s, of course. 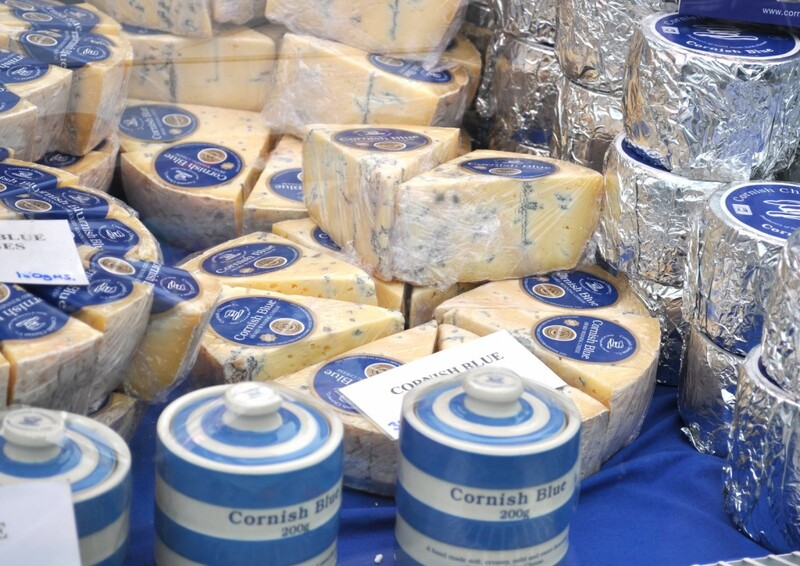 Rodda’s is a well known family Cornish Dairy, www.roddas.co.uk Just as Trewithen is too, www.trewithendairy.co.uk. Both were offering the typically English summer dessert of strawberries and clotted cream, served sometimes with freshly baked scones. Not best for the waistline, but absolutely delightful for the sanity. And now, I offer you a gallery of all the other delights to be found in the food hall. 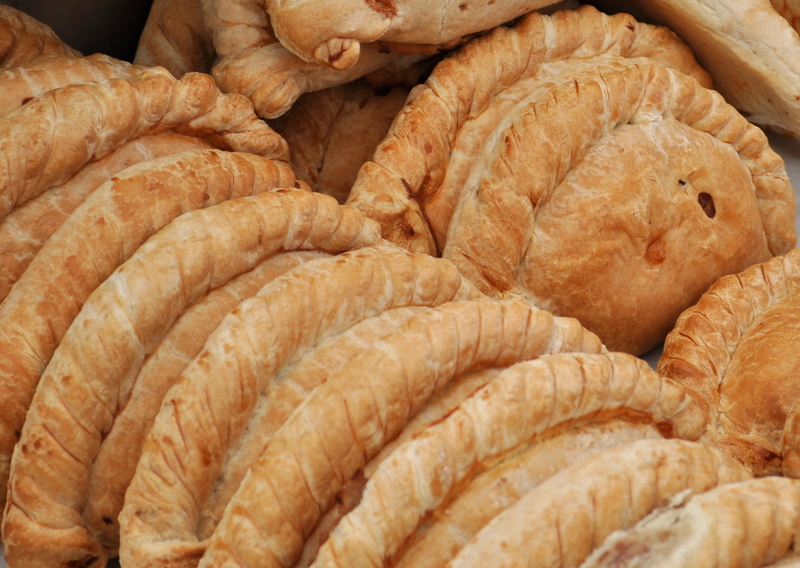 The Cornish pasty by Grumpies. 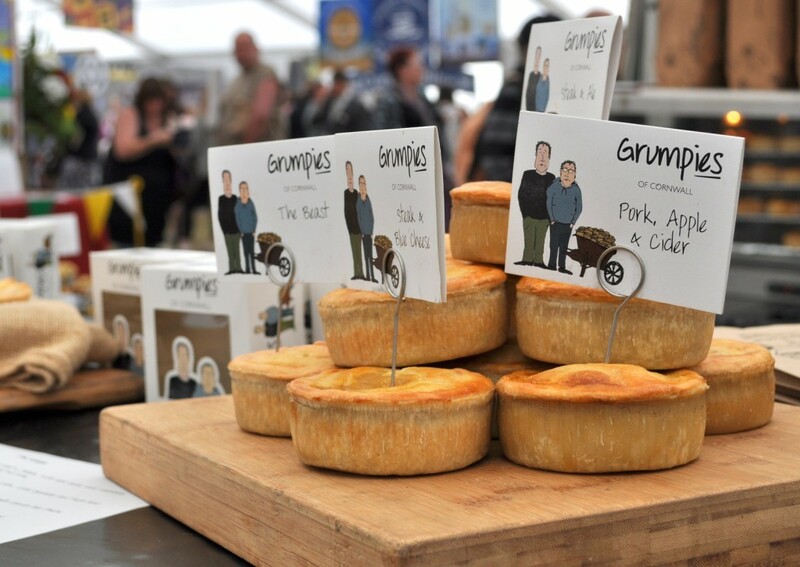 There were other Cornish pasty makers at the show, but Grumpies caught my eye. I now wish that I had bought one to try, but they did and do look scrumptious. 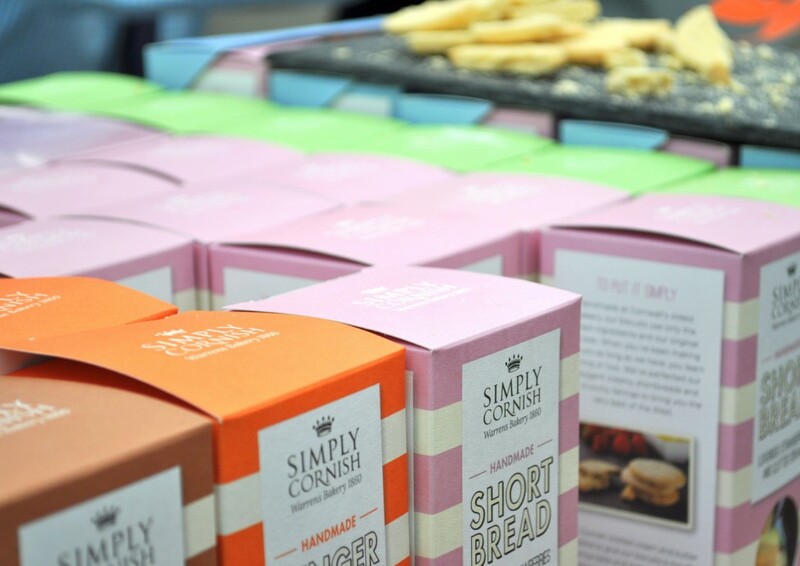 Biscuits and pastries by Simply Cornish at: www.simplycornish.com. I bought a box of the strawberries and cream and apple crumble shortbread biscuits as gifts and a treat for the grandmas back home. And something to drink; something refreshingly non-alcoholic and something refreshingly naughty! Fruit juices from Helford Creek apple juice and cider maker, www.helfordcreek.co.uk. 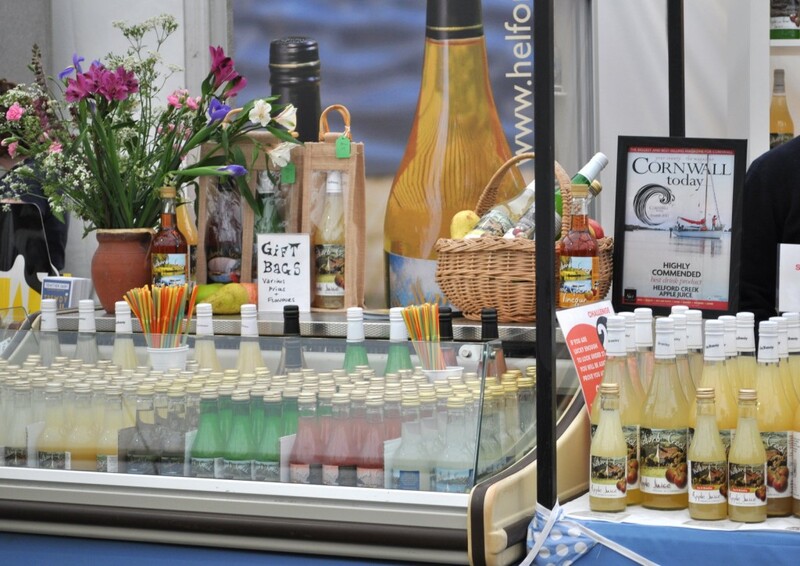 Flavoursome apple juices and ciders by Cornish Orchards, www.cornishorchards.co.uk. 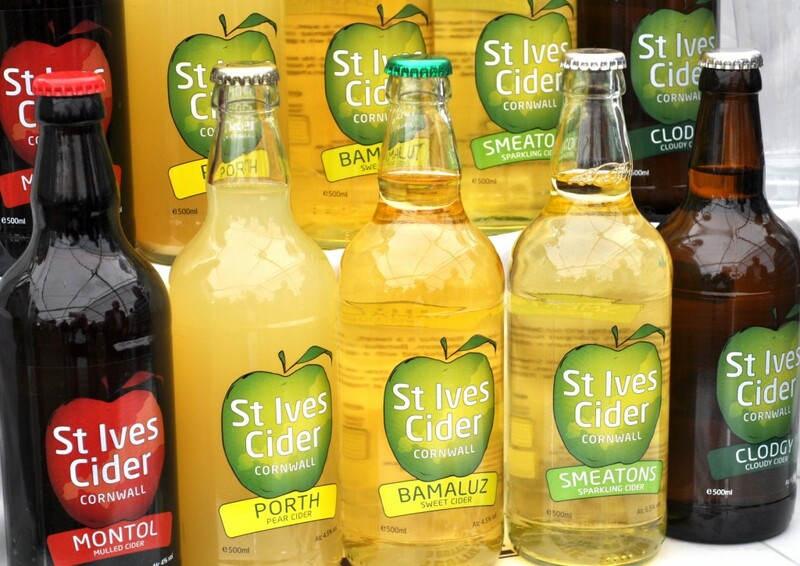 The drinks are made from the fruit of small and old Cornish orchards, hence the name. Speciality ciders in St Ives, www.stivescider.co.uk. Expert wine making is combined with cider making techniques. 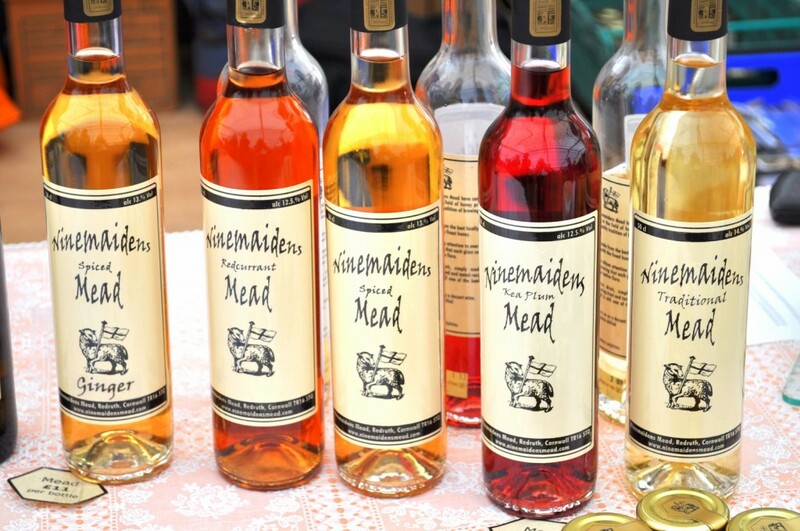 Ninemaidens Mead of Cornwall ferments honey and flavours it to make its range of exclusive meads. Mead should be drunk like sherry or dessert wine, as an aperitif, in small glasses at room temperature or chilled. 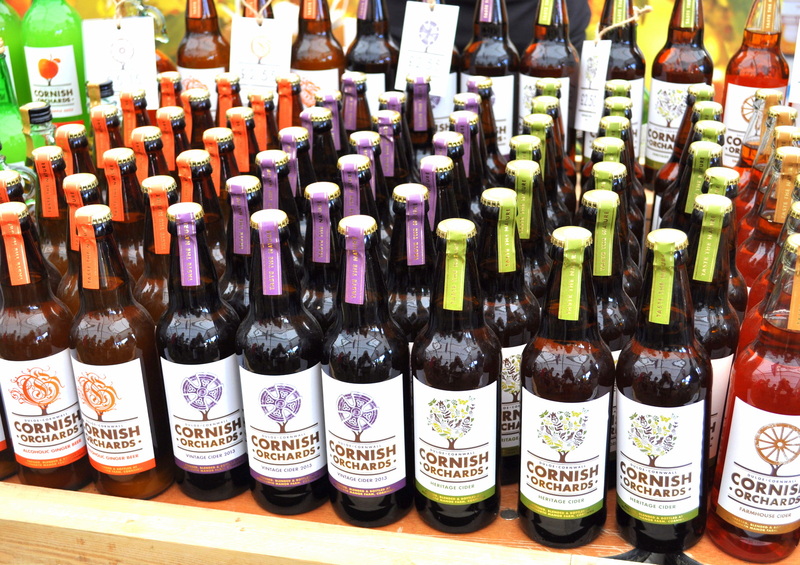 All these drinks are produced in Cornwall using Cornish produce where possible. 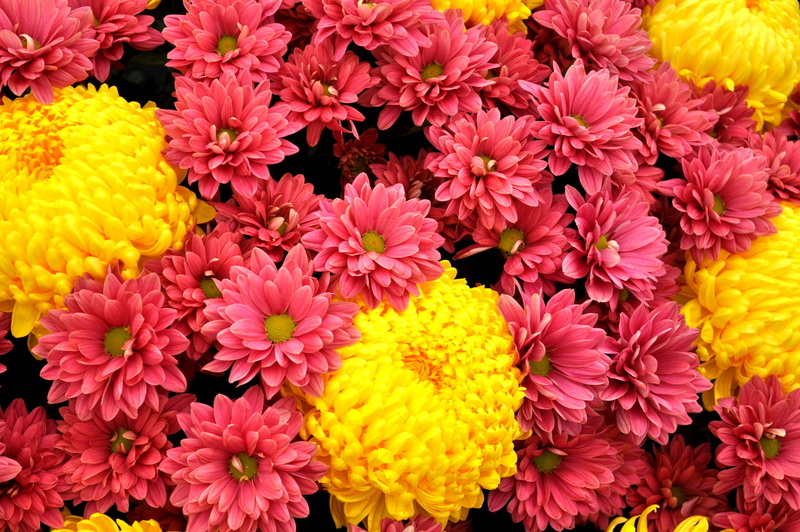 www.ninemaidensmead.com. 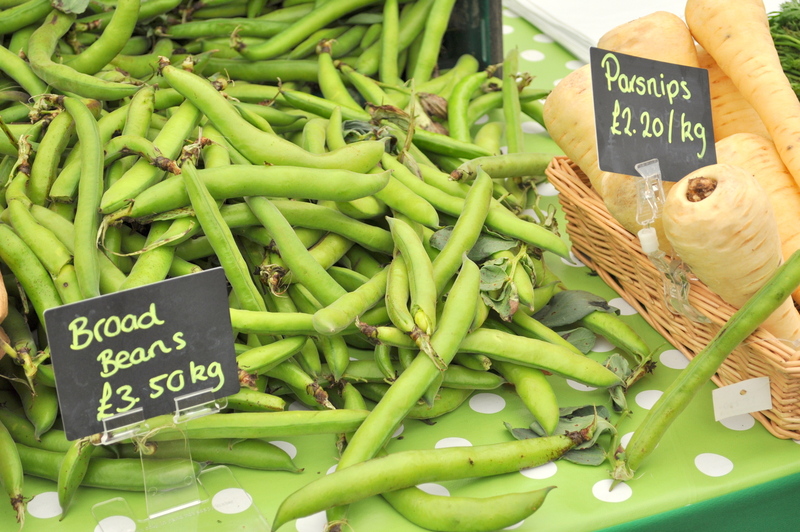 As you would expect from an agricultural show there was plenty of fresh, local produce too. Perfectly formed strawberries and wholesome, crisp looking vegetables. 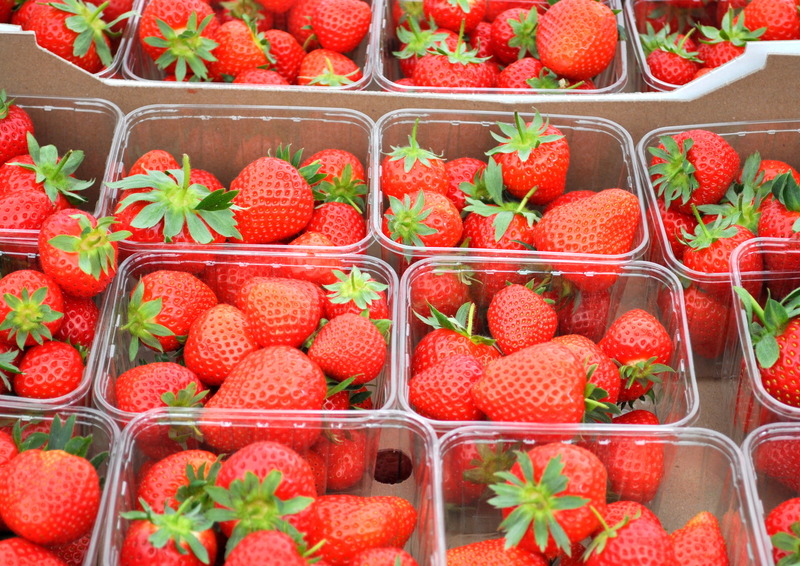 The strawberries from Boddington’s Berries at: www.boddingtonsberries.co.uk. And the asparagus from Tregassow Manor Farm at St Erme, near Truro, Cornwall. 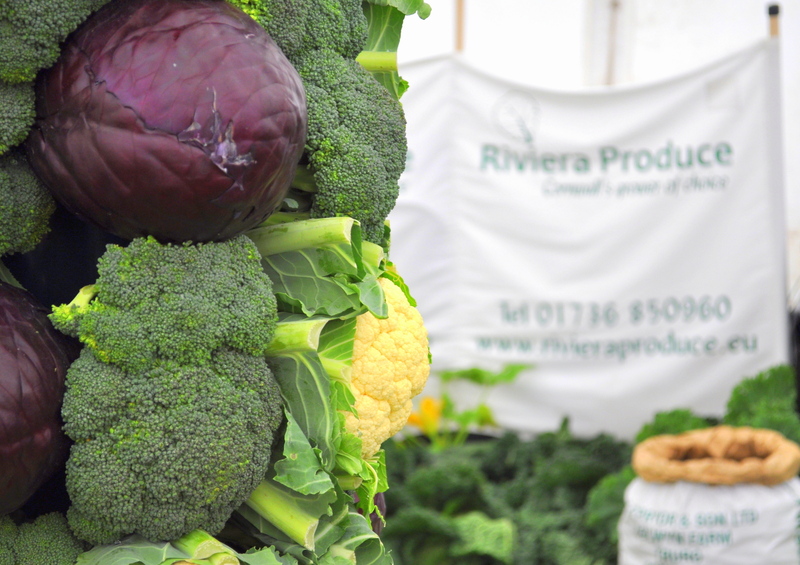 Riviera Produce is well known for its cauliflowers and spring greens. 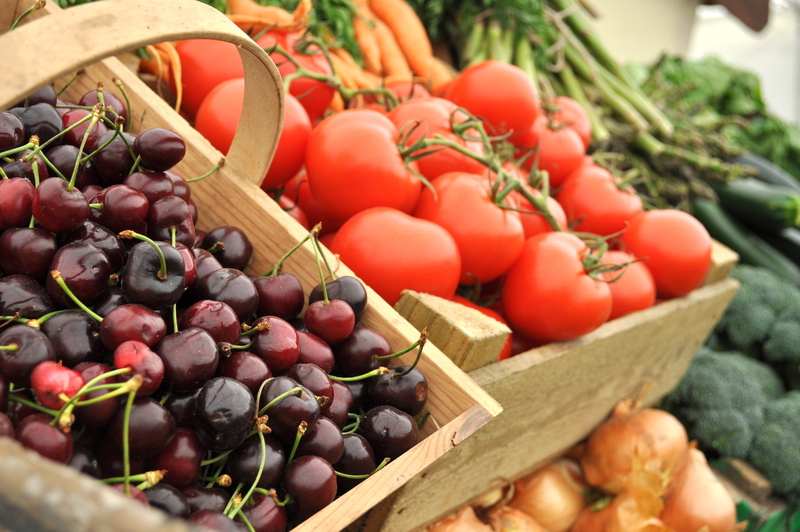 www.rivieraproduce.eu. 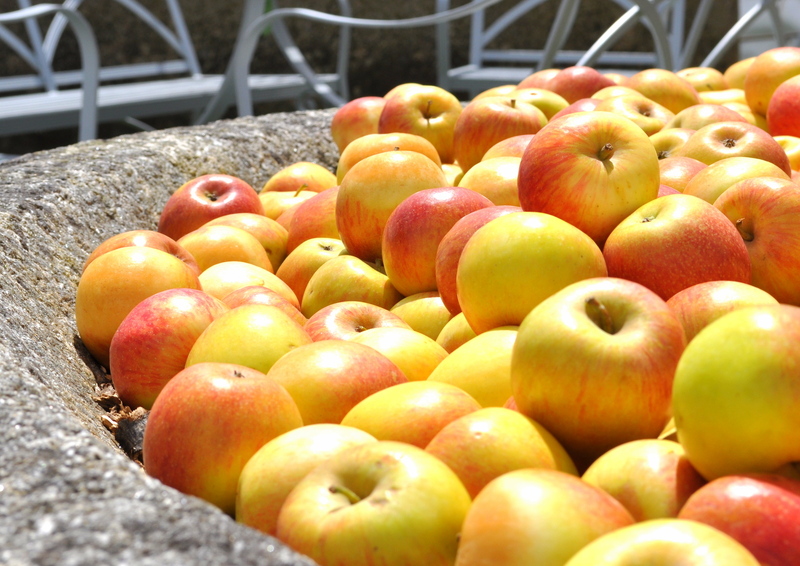 The apples featured here were not for consuming; they were decoration on an old 19th Century apple crusher at Ben Jones reclaimed architectural granite stand, www.extremegranite.co.uk. 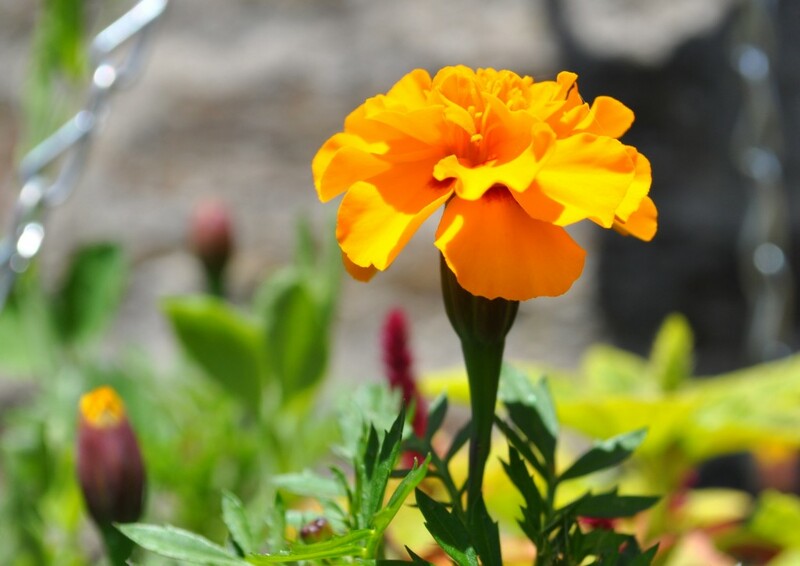 Old granite has become increasingly popular over the years as garden ornaments; a less practical purpose than intended for the original designs, but at least they live on beyond their original use..
Colourful flower and plant displays were in abundance in the flower tent. 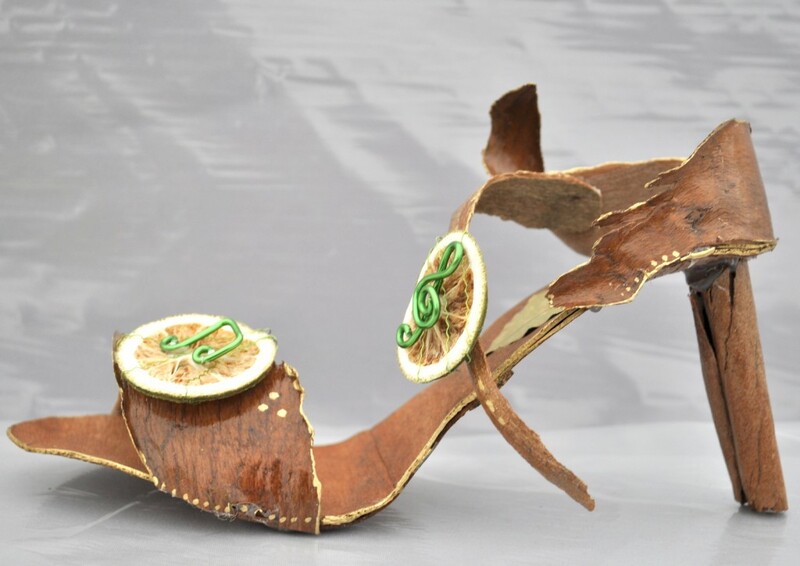 Awards are presented to the best displays and nurseries, and fun competitions take place such as design a shoe with nature. I would be very happy to wear the design seen here, if only there were two! 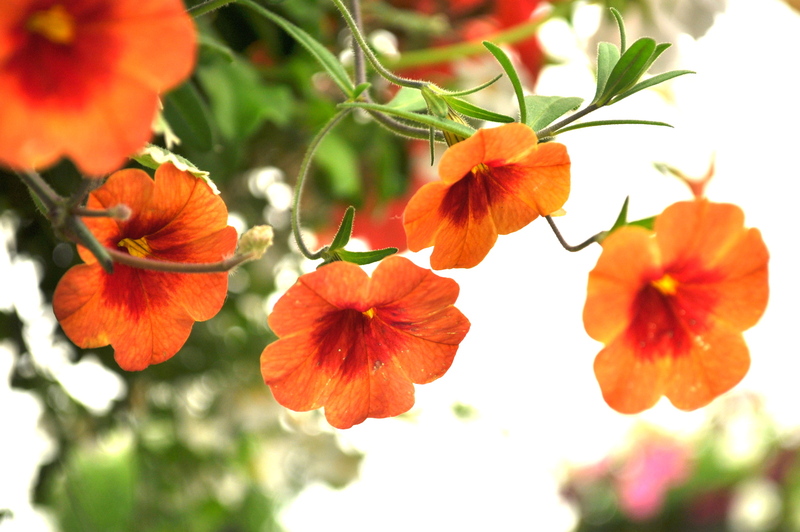 Orange flowers were a popular theme this year. 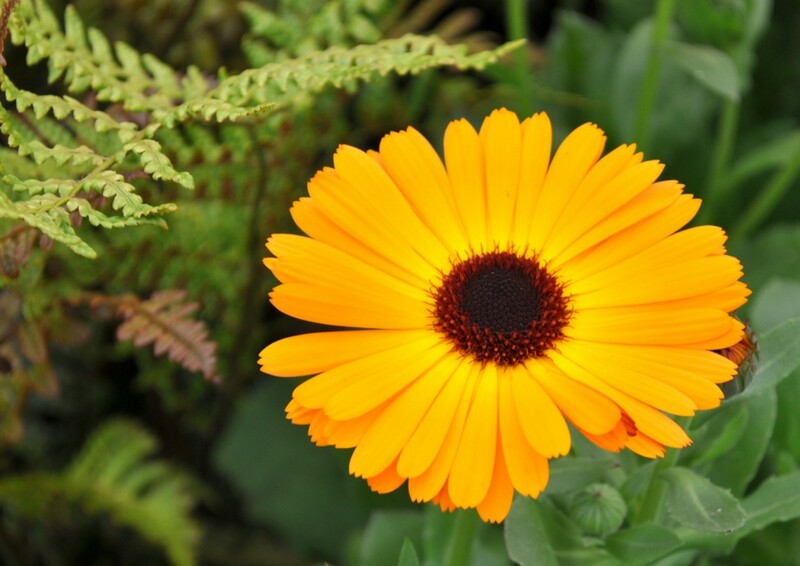 As I have said in an earlier message, I do love the vibrancy of orange and it appears that others do too. I guess it shouts summer sun and sand. 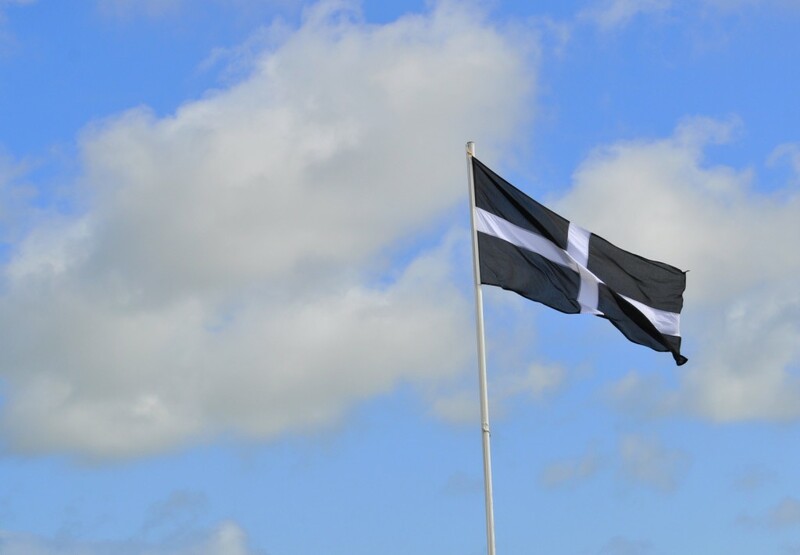 The Royal Cornwall Show is a fun day out for everyone and one could easily spend the full three days there, to do it justice. There is just too much to see and do in one day, especially if you want to take advantage of all the varying places to dine, snack and drink. Coffee Bean bars abound, along with beer, wine and cider tents. Food from chips to veggie burgers to fine lobster can be consumed. All these things take time and as much time as you can get is what is needed when you visit the Royal Cornwall Show. The dates for next year, 2016, are: 9, 10 and 11th June. Pop these in the diary now! Before I go, I just need to share these wonderful wooden rabbits with you. They were found perched on outdoor wooden seating by outdoor furniture makers Fry’s Teak Garden Designs. The company also offers exquisite teak root, life size horse sculptures: www.frysteakgarden.co.uk. 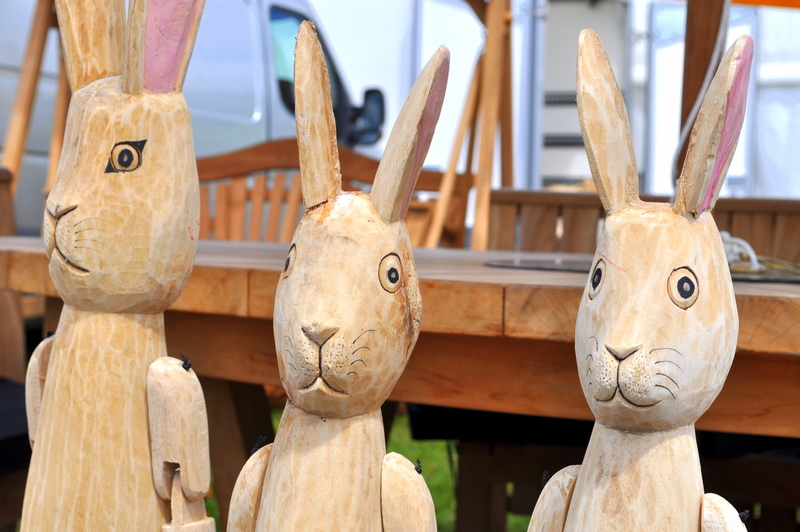 Whilst the horse sculptures are amazing craftsmanship the wooden rabbits made me smile; and that is what The Royal Cornwall Show should be about: bringing a smile to everyone’s face. Maybe next year I’ll make it to the fairground. This year I had no more time for play, instead I raced home with some of my newly purchased produce with which to make a cake: Strawberry, Lime and Cream Sponge. I was off to a friend’s birthday barbecue that evening and what could be more apt than a birthday surprise full of fresh, Cornish fare. Happy birthday to Sally. 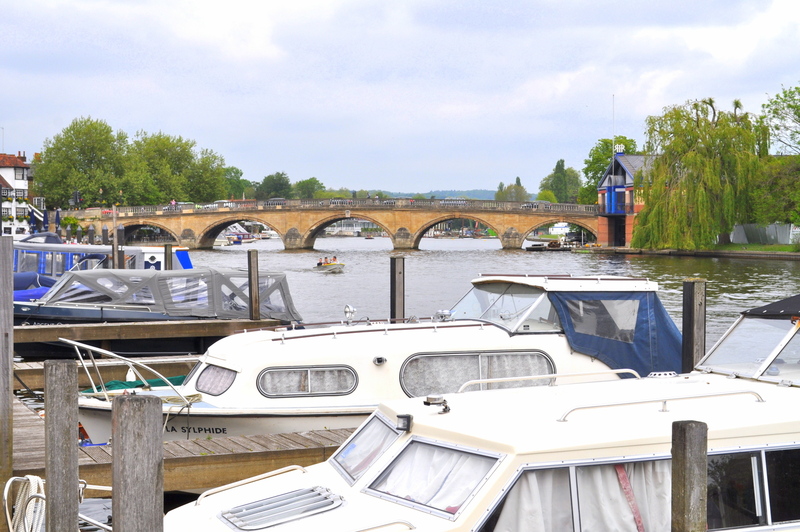 I had never been to Henley-on-Thames before, so it seemed obvious that, as I was in Oxfordshire, it was a place I should visit and that is what I did. 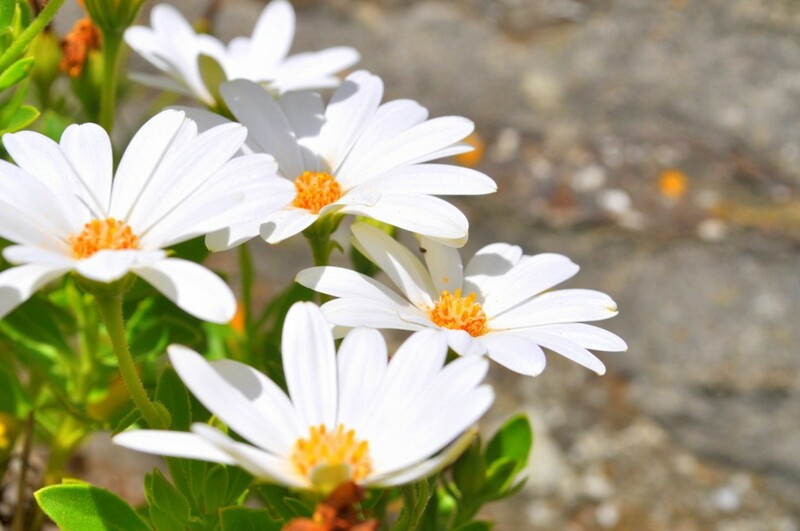 I did not do it alone; it was when I was on holiday with the family recently and, with a friend living in the county, it was a great spot to meet up with her and her two charming daughters. There we were six girls against two boys – lucky boys! I am not sure if they saw it that way; we dragged them from clothes boutique to homes store; there are quite a few interesting shops in Henley. 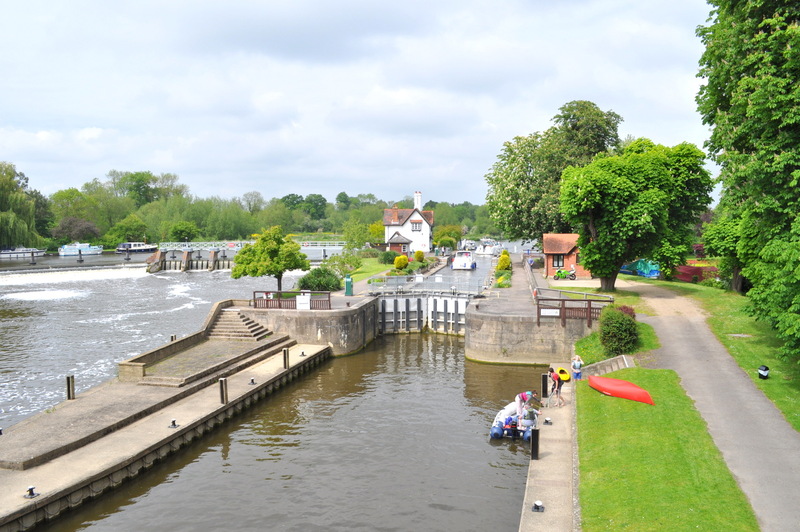 They did enjoy the walk along the river though; the river so famous for its boating, boat races, rowing and regattas, especially the Henley Royal Regatta held every summer. The 2015 Royal Regatta is being held from 1st until the 5th July. On those occasions everyone dresses up and I believe it to be a little busier than the day of our excursion. If my sources are correct, I believe the five arched bridge was built in 1786. A few boats have passed under it since then! 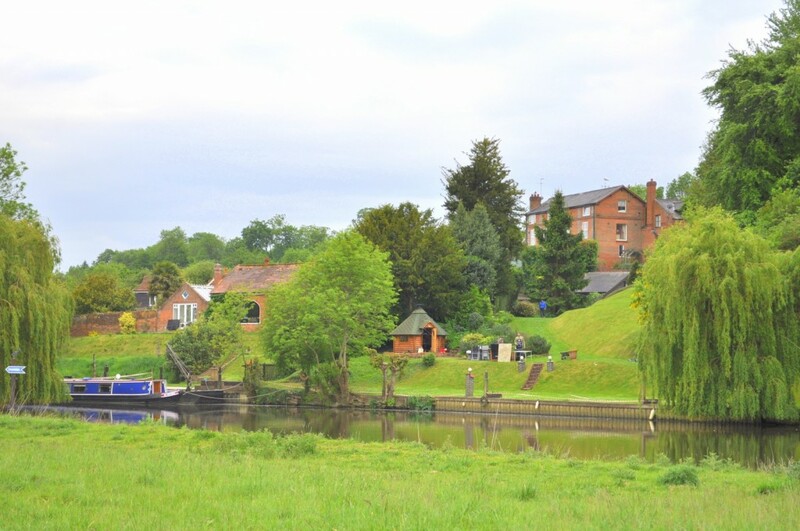 The river also has its own island with an interesting collection of exclusive homes, only accessible by boat, but a prime viewing spot for the river activities. 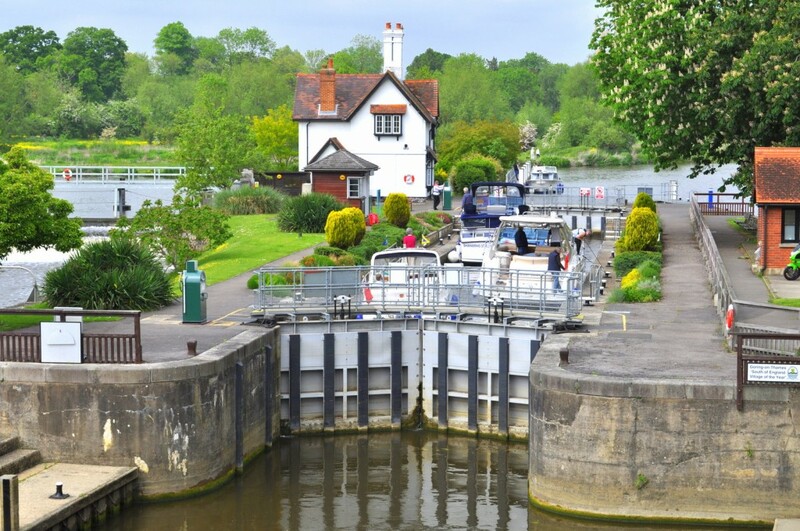 If you are tempted to visit, Henley can be found just 36 miles west of London and just 23 miles south east of Oxford. Island living above. 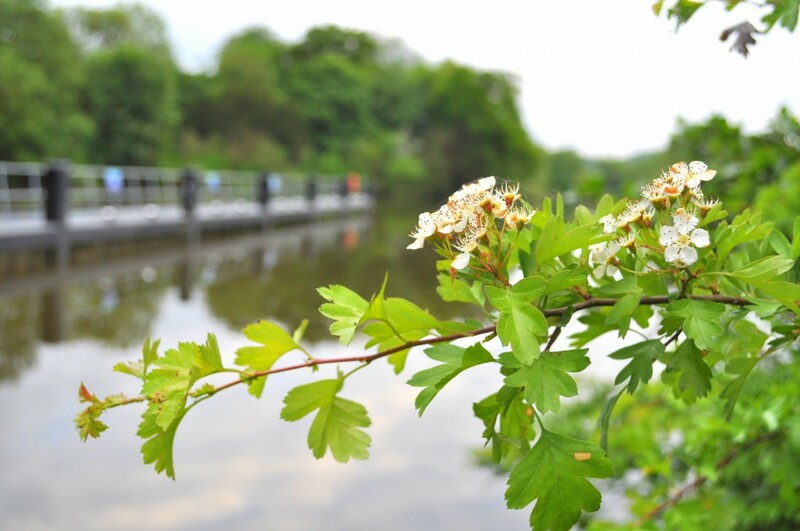 It offers accommodation for more than just people, but wildlife too. 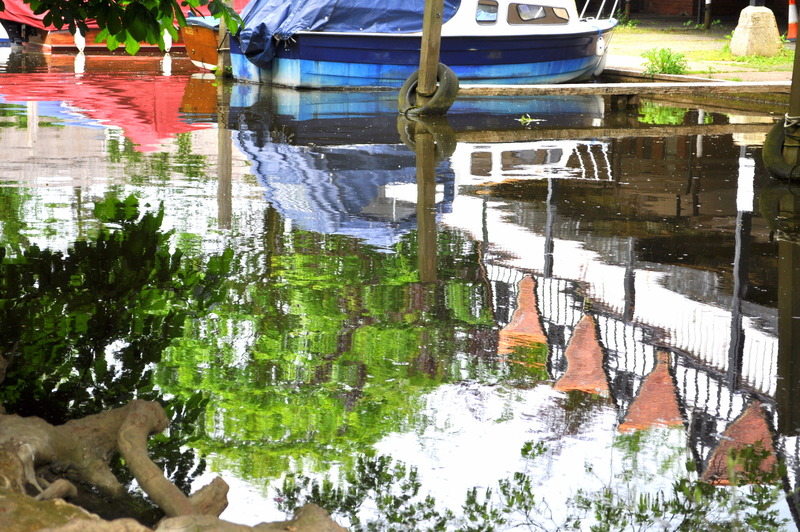 All that we need is a boat to get across. 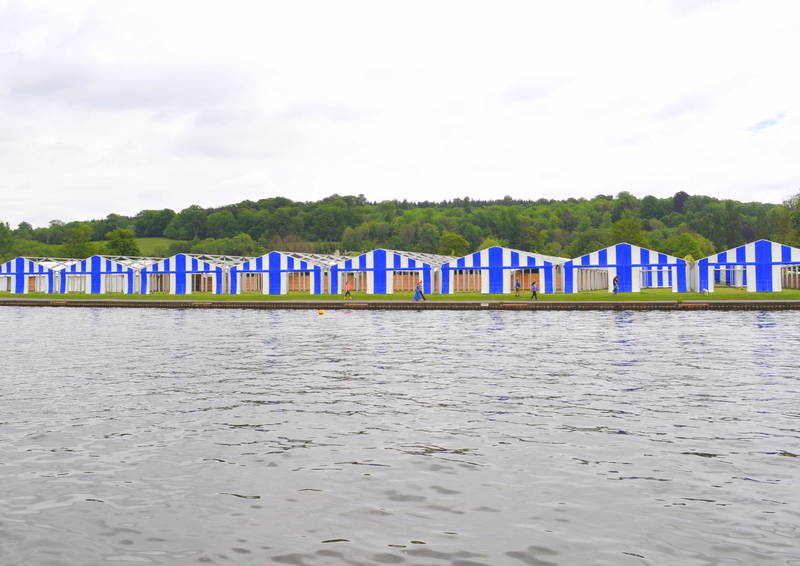 I guess that the blue and white part constructions below are in preparation for the regatta season, soon upon us, when there will be plenty of boats mulling around. With all the exercise we were quite parched and tummies rumbling, so we stopped for cake. 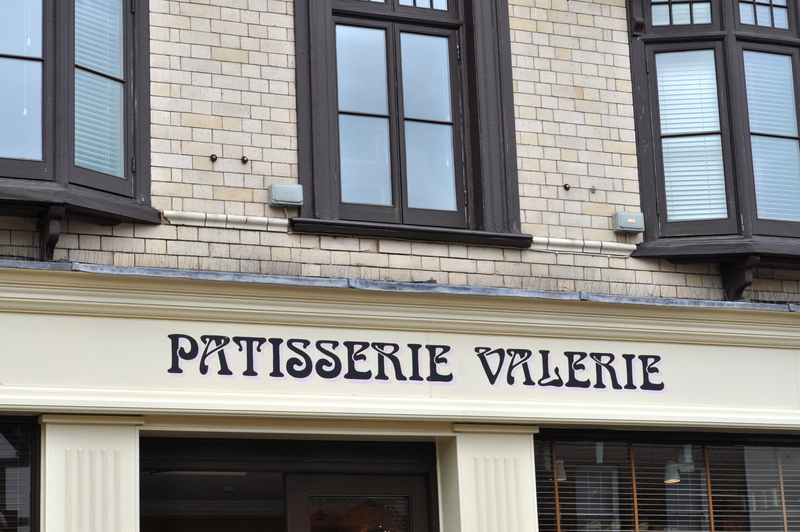 And upon my friend’s recommendation, we stopped at Patisserie Valerie in Market Place where, on a warm day, you can sit outside, which we did. 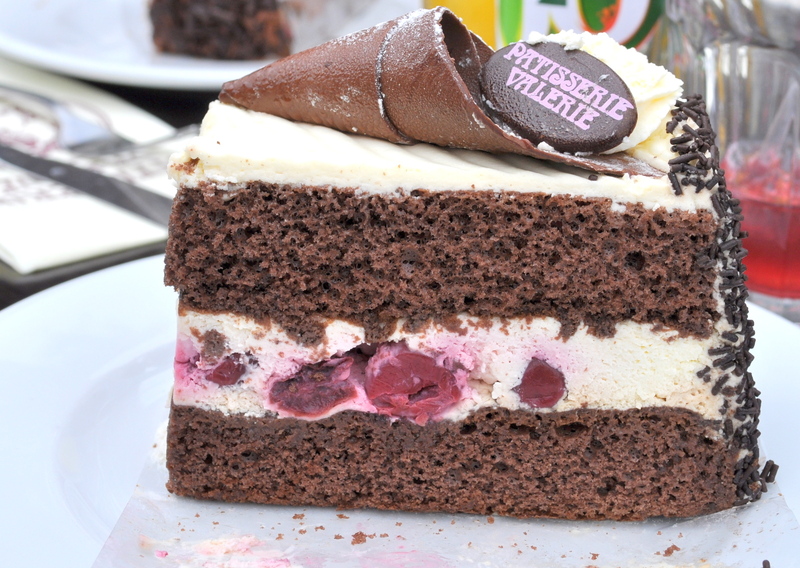 Of course, where there is plenty of cake, we eat cake; large slices of light and creamy chocolate cake, black forest gateau, chocolate brownies and fruit tarts. They made me feel as though I wanted to rush home and bake. 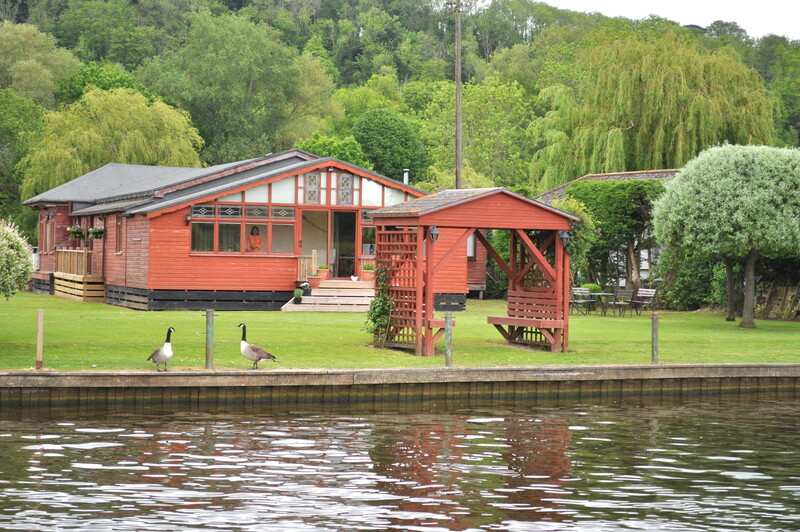 Henley also has a park by the river for younger children to play, families to picnic and couples to relax. There are plenty of benches to rest on and large trees to offer shade from rain and shine. 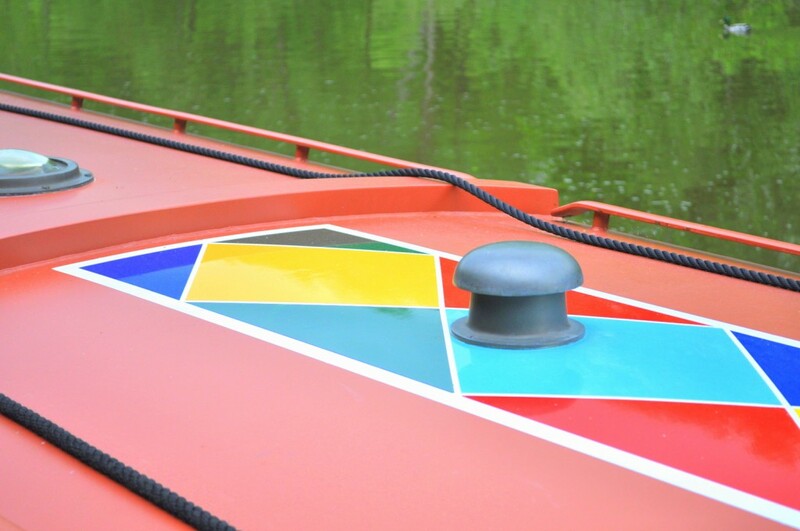 Vessels of all shapes and sizes trundle by; there is no need to hurry here. 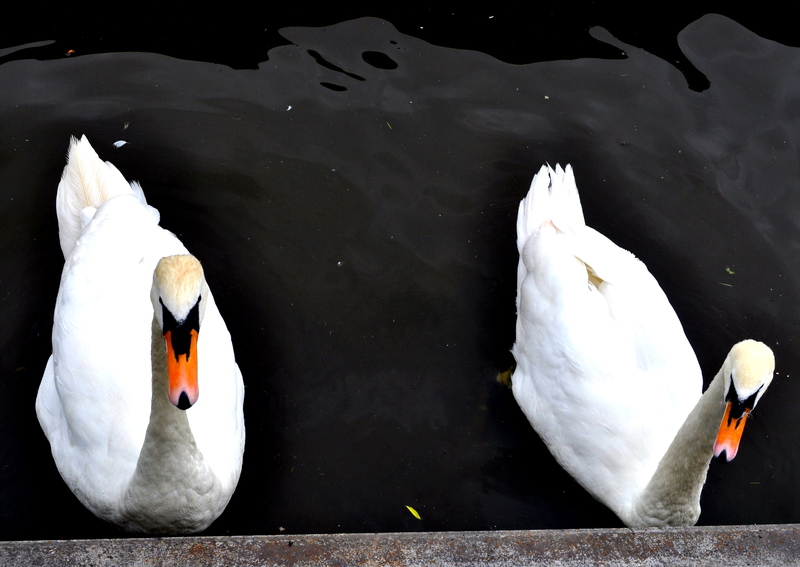 Not only do boats occupy the river and use the slip ways, but the swans and other bird life do too. 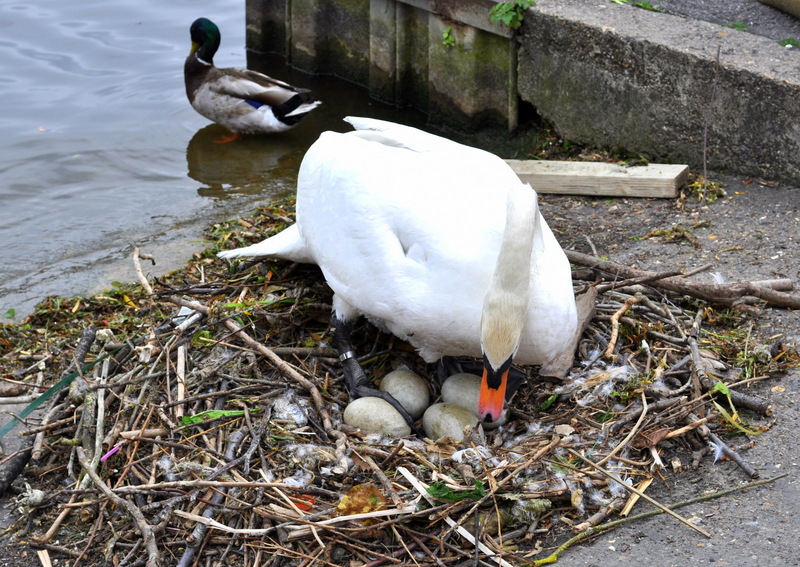 In particular, one swan had chosen her very public nesting place from where to hatch her cygnets. She was being protectively watched by ducks and fellow swans. It was a lovely day had by all. But, with so much walking, indulgent eating and shopping, all that we wanted to do by the end of it all was to flop down and stretch out; just as my friend’s dog, Gracie, had done the night before. That’s right! 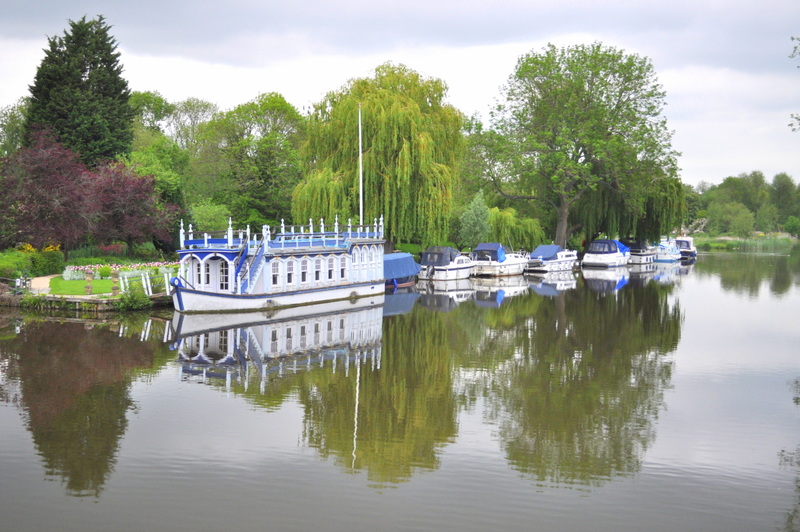 We had all enjoyed another long walk, the previous night, along a more northerly stretch of the river Thames, where we were entertained by the melodies of wood pigeons and cuckoos. They were not the only ones making noise, as the four daughters we have between us, my two teenagers and my friend’s teenager and 21 year old, chattered happily as they caught up with all their gossip. My friend and I could not resist a good natter too, having not seen each other for a few months. The big boy and teenage boy amongst us simply fooled around, as boys do! 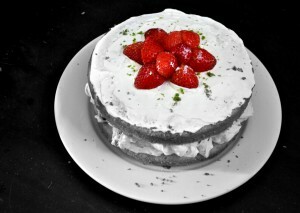 The day was finished off with barbecued meat, tasty salads and more cake. What more could a girl want to end a perfect stroll along the Thames? Oh yes, a glass of chilled white wine! From time to time we all need a break from normality; even if that normality is not so bad. Last week we took a few days away with the children and headed to a good friend’s house in the beautiful English county of Berkshire. My dear friend and her partner were off to the sunshine of Italy and offered their home to us. With another dear friend living just across the border in Oxfordshire, it was an opportunity we could not miss. My eldest was a little traumatised by the idea, being slap bang in the middle of her GCSEs, but we managed to convince her that: one, she could still study whilst away and secondly, a break here and there would do her studying some good. She conceded and off we went. My friend, the one sunning herself in Italy, lives just a few miles from the stereo-typical English village of Goring. 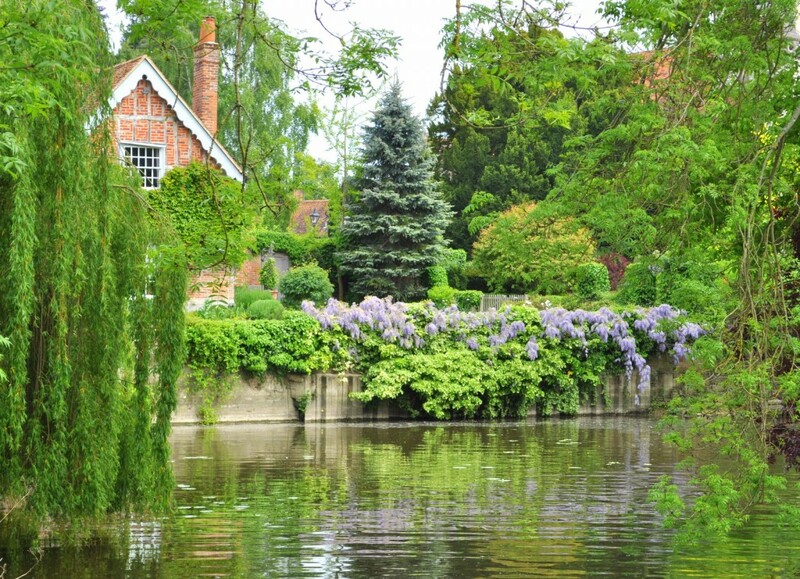 It straddles the river Thames with quaint wisteria covered cottages, white-washed houses and grander brick, flint and stone mansions. I may be corrected by those in the know here, because Goring does not really straddle the river, its adjoining village of Streatley does one side, but, as they appear to merge into one another close to the river, I believe them to be one of the same. They share a railway station and the same cluster of shops, pubs and restaurants in support of my argument. But, Streatley is in Berkshire, as my one friend’s house is, and Goring is in Oxfordshire, where my other friend’s house is; so, I’ll let you make the final decision on whether or not they are one of the same? 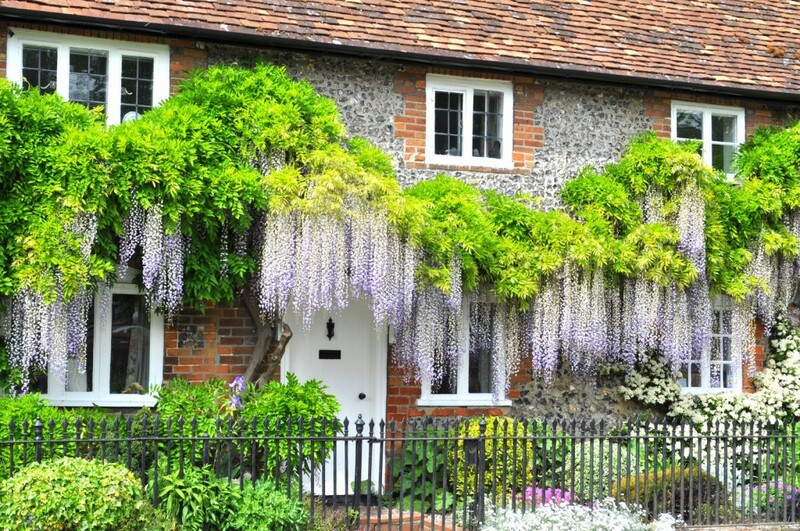 Whatever the conclusion, I think everyone will agree that Goring and its neighbour occupy a desirable part of the English countryside. So, there we were, having travelled from one delightful part of the country, that is the south west, to another, to enjoy a break from our normality. I say that, but as anyone with children know, wherever you are with the kids they somehow manage to keep things normal! I won’t bore you with pictures of the dear ones, not yet anyway, but I will share with you some of the wonderful sights that we enjoyed on the Berkshire and Oxfordshire border. 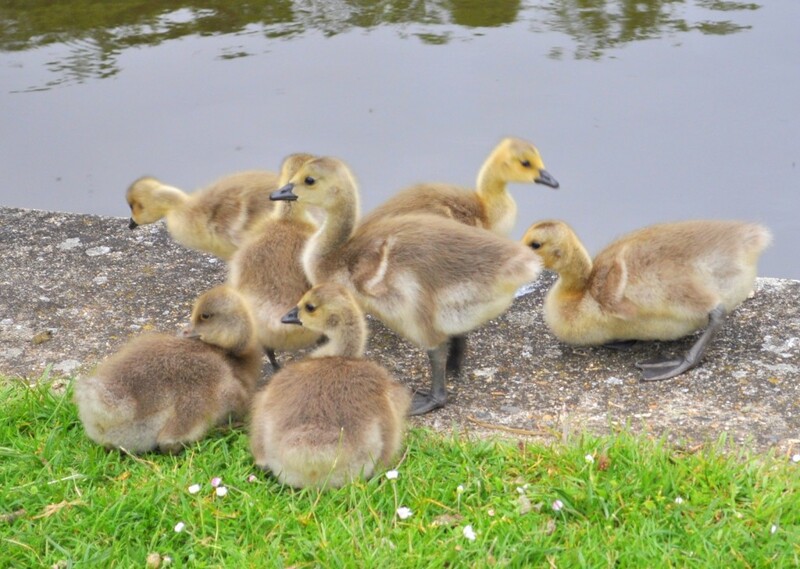 We walked and, sometimes, talked along the river in both directions and met with many a fluffy gosling, duckling and signet. 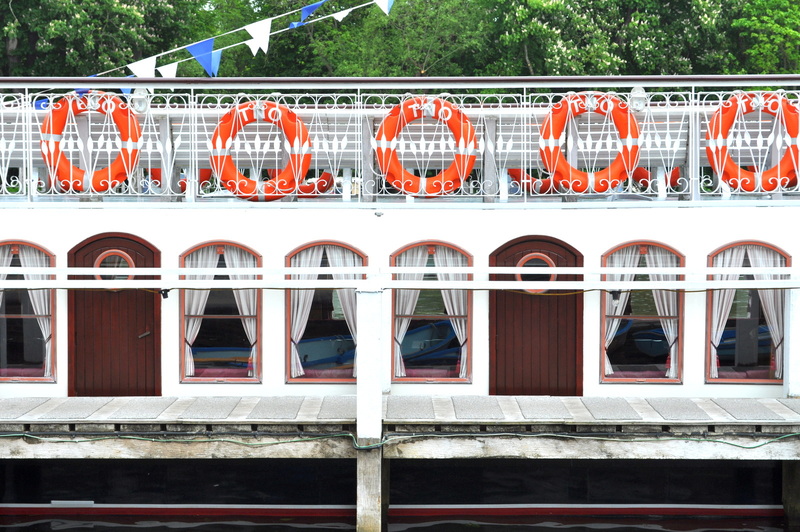 Colourful narrow boats, glossy speed boats, shiny motor cruisers and grand gin palaces chugged by, passing the bubbling weir and steering a way through the village lock. I could imagine the French impressionist painter, Claude Monet, sitting here, next to the river, with his easel and large palette of colourful oils. He would be painting one of his famously styled water lily interpretations; like the many he created during his prolific water lily period of 1909-1926. 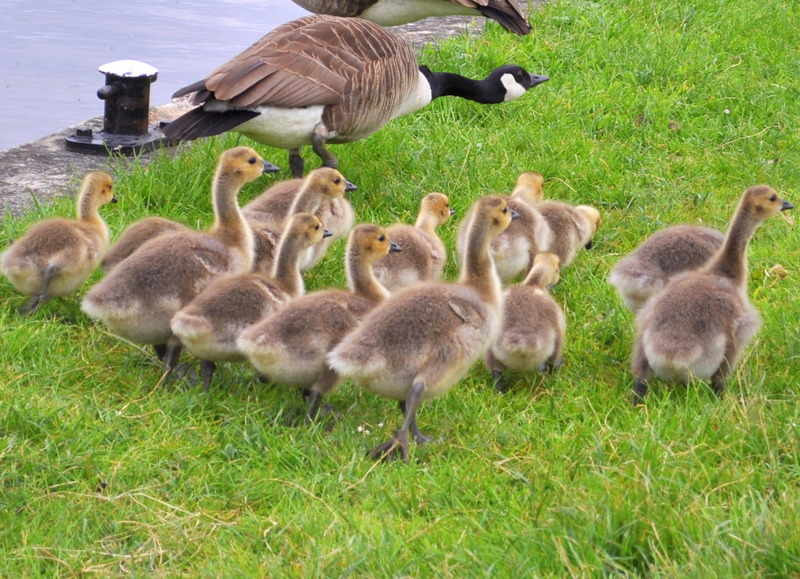 The goslings scurried away, and the geese cautioned us. 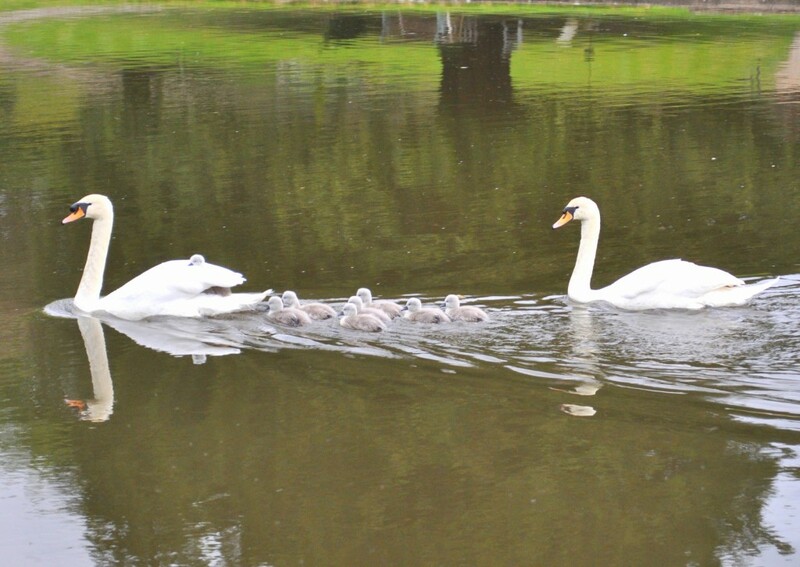 The swans just glided nonchalantly across the water with one sneaky signet catching a ride. But, of course, being so close to water does mean that all things revolve around it, in it and across it. 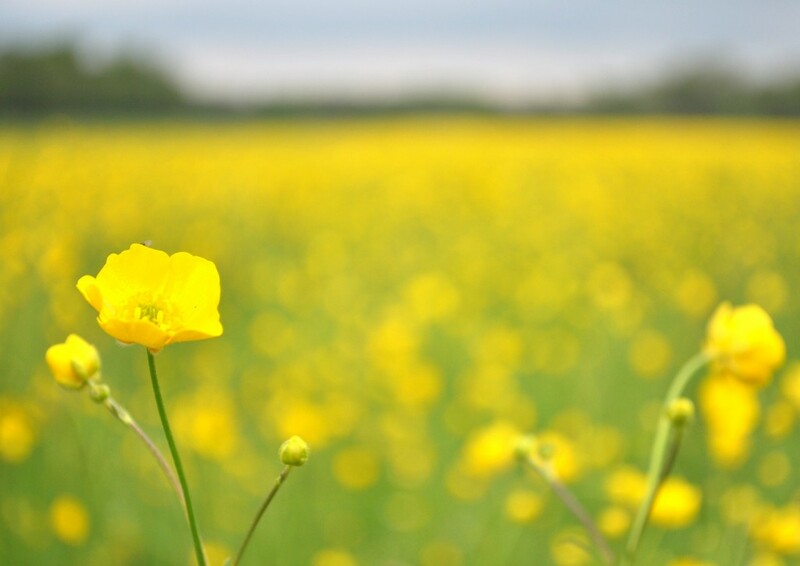 Buttercups were starting to flourish in the meadows and sheep were grazing on the grass along the river banks. Boats were moored up at random along the water’s edge. I saw one playful couple having a game of badminton on the pasture close to their small river cruiser. Youngsters could be heard yelling with excitement as they battled to stay dry in their rowing vessel and a hum of an engine could nearly always be heard, somewhere close by. 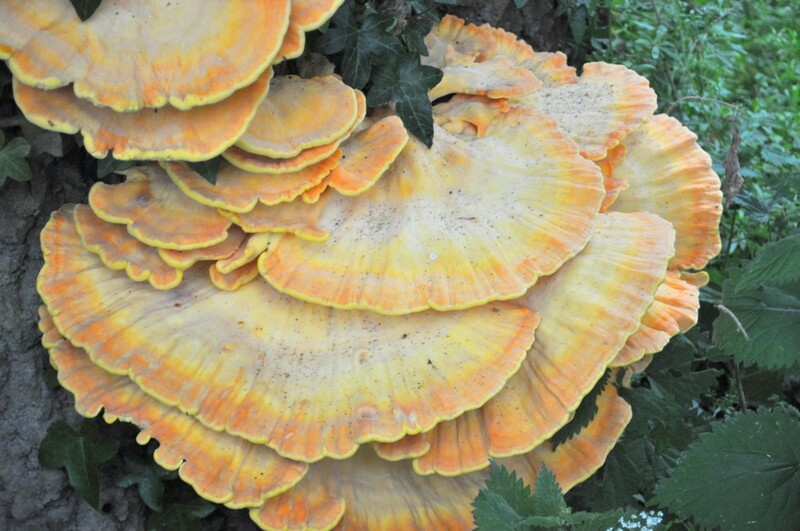 During one evening’s walk we spotted an attractive bright orange growth on the side of a tree; some kind of fungus, I guessed. It looked as though someone had hacked a chunk off and we pondered if it was edible. I know very little about such foods and we left well alone. The air was so still on another occasion that the river reflected images as a mirror. 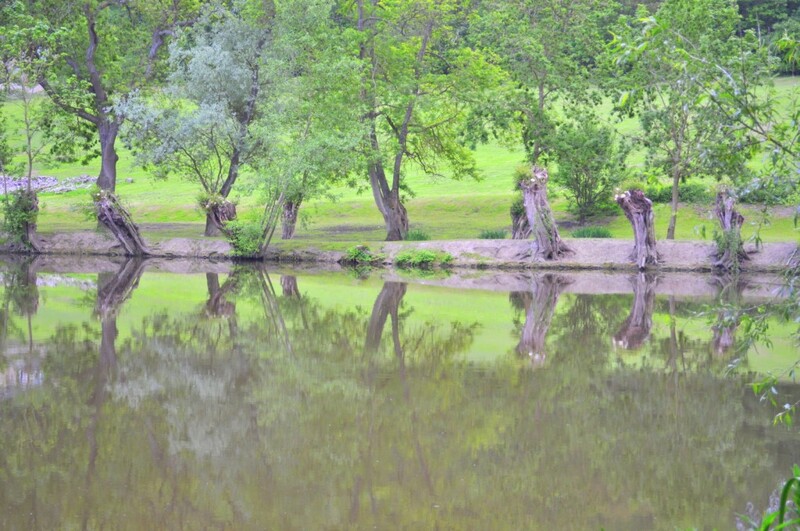 Along one section of the Thames, south of Goring, trees had been lopped to give better visibility for those on the water as well as those of us on land. They became accidental sculptures. 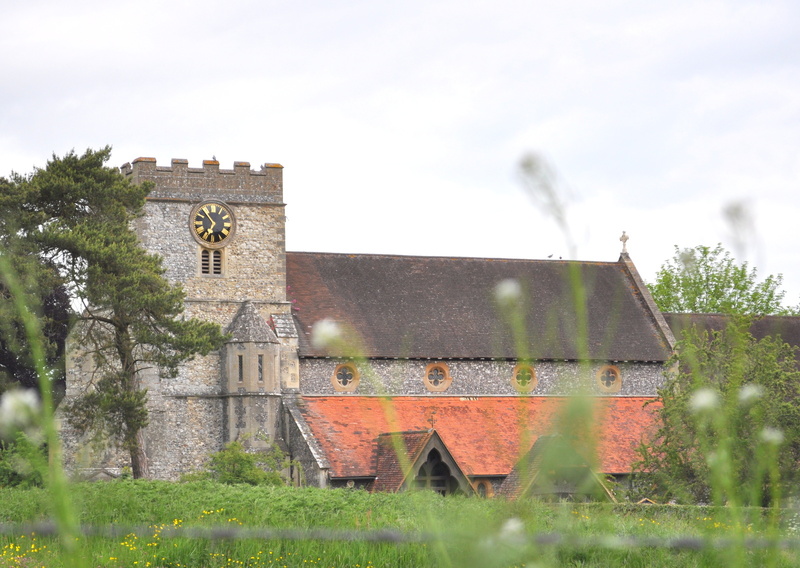 With a railway station on the main network line between Oxford and London, Goring is easily accessible for visitors and commuters. 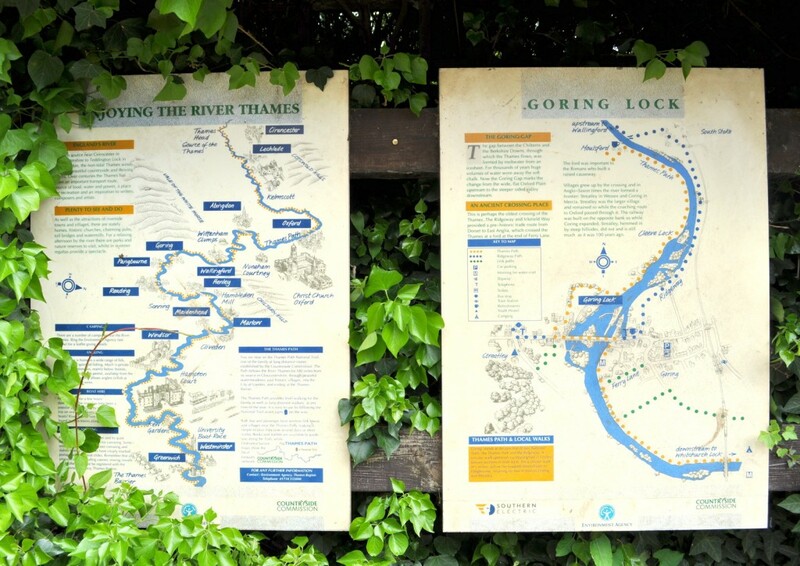 And, if you do find yourself spending some relaxing time in Goring, I can recommend a friendly place to eat; whether this be just for a slice of delicious homemade cake and hot coffee or a more substantial lunch time fuelling. 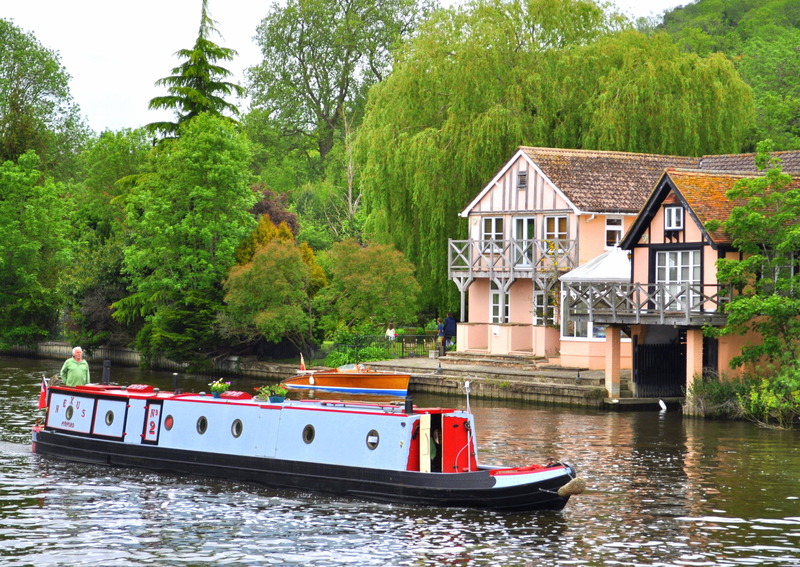 Pierreponts café, which is a mere one minute walk east of the Goring and Streatley bridge, is open for breakfast from 8am and closes it doors at 5pm. 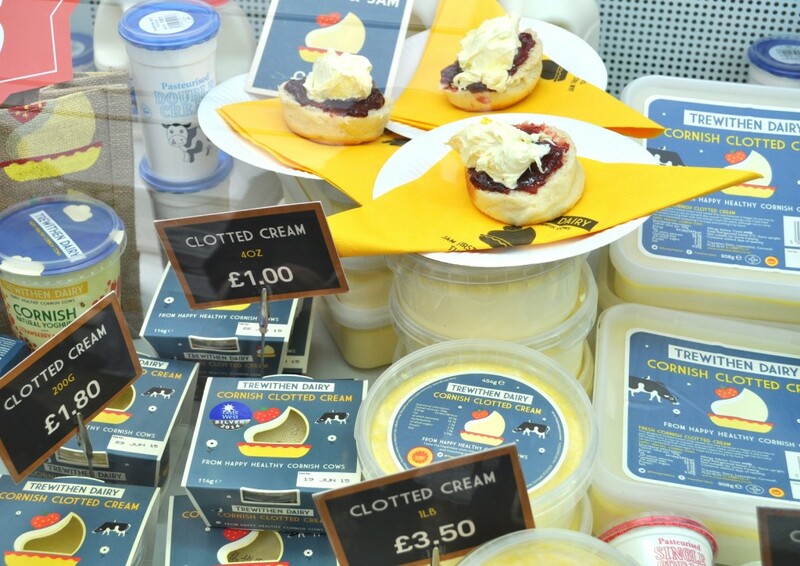 From porridge and full fried English breakfast to tasty wholesome snacks and lunches, there is freshly made, home cooked food to suit most tastes. 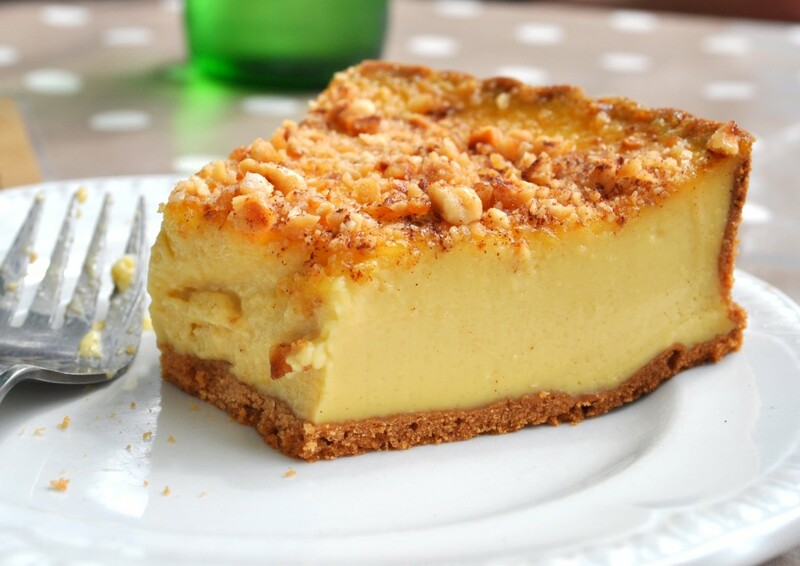 For a sweet treat, during our morning coffee break, I enjoyed the delicately light and creamy, custard, maple syrup and hazelnut tart; I would recommend this one The brownies were very tasty too, so the children confirmed, and it all looked wonderful. We were fortunate that the sun was shining and an outside table was vacated just as we approached. Cake, coffee, family and sun, and all at the same time; what more could a girl want? Actually, I almost forgot to mention that there is a small, but well stocked, art gallery in the village; simply called Art at Goring. If you love art, as I do, then this gallery is worth a visit. There is more to come about our family trip away, but I thought sharing the delights of our accommodation location was a good place to start. It has been a busy few days in the garden. 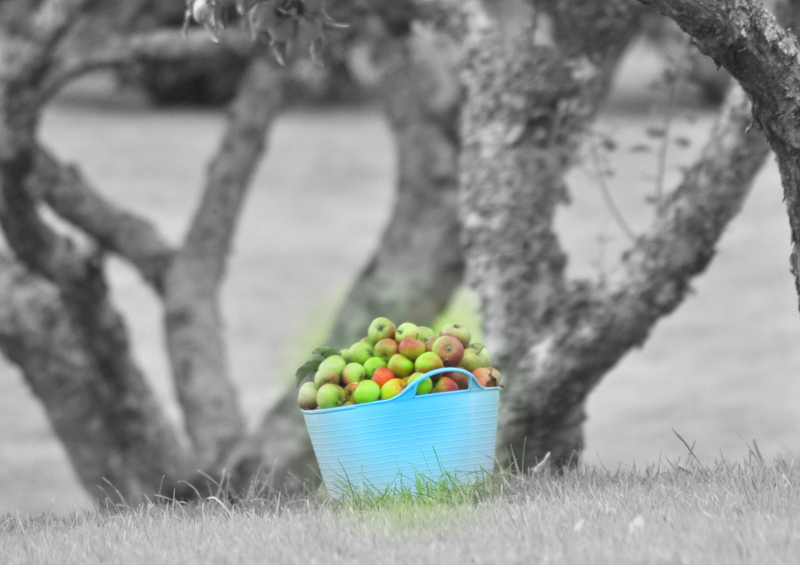 The mixture of sun and rain has brought the grass on and the seedlings are maturing; flowers are starting to bloom and the apple trees blossom has sprinkled the orchard with confetti. Not only have the lawns required mowing, but the hedging needed a hair cut; planting containers needed a good clear out and the seedlings needed larger vessels. A few weeks ago, and in readiness for the summer time garden, we sowed the seeds of sweetpeas, marigolds, pansies, and a few more that I must remind myself of what they are called; I am not a natural gardener and have only recently begun the long journey in finding my green fingers. 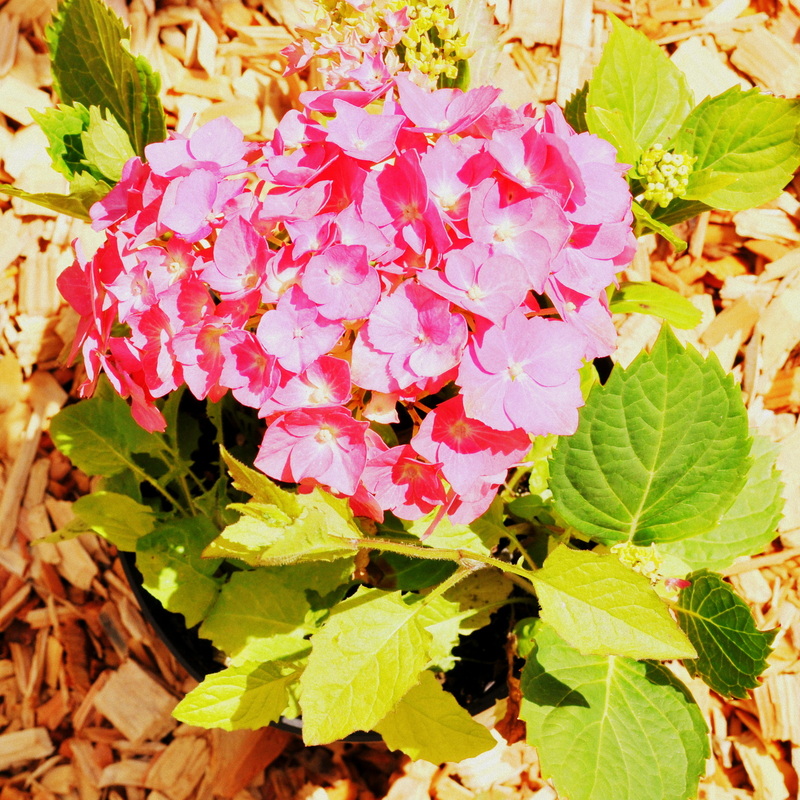 But, I am proud to announce that the hydrangea cuttings, that I nurtured from last year, are almost ready for finding their new home amongst the elders. And with it all starting to look so lovely and the sun shining I could not resist taking a few pictures from our garden and sharing them with you. 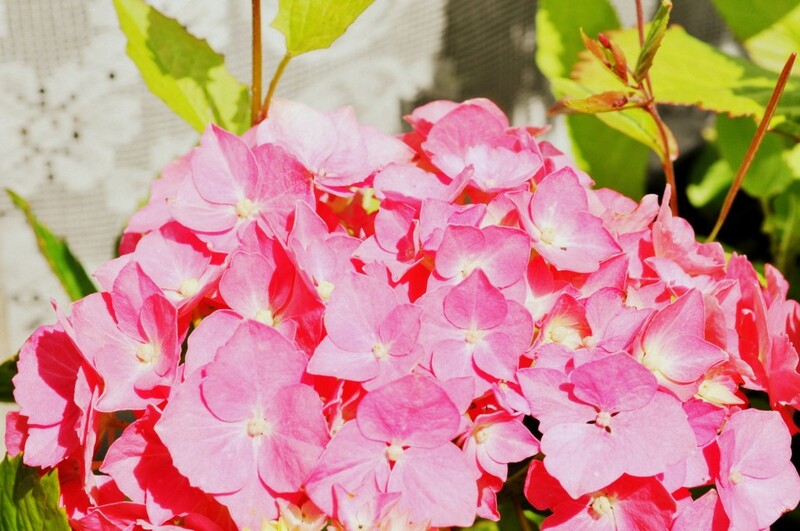 The garden is lit up by the vibrant colour of a young hydrangea. 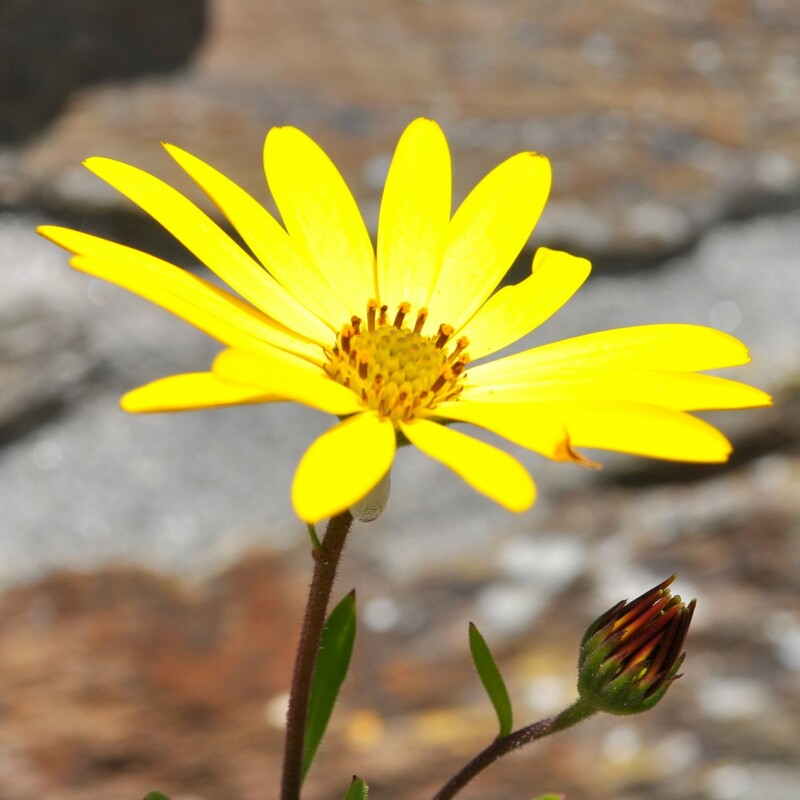 It is incredible to think that this was just a tiny sprig stolen from one of the giants last year. It is now time to find it a more permanent home, along with the other six! 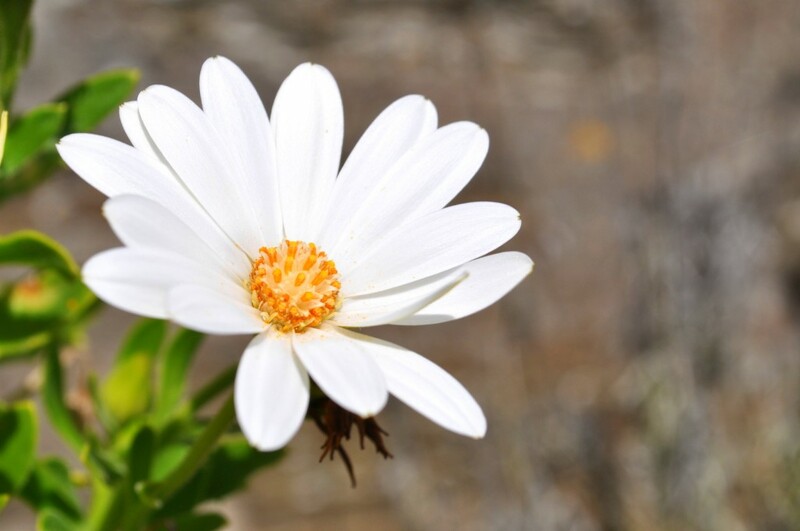 The white and yellow daisy-like flowers and bright purple plumes are flora that just keep emerging year after year in our planting containers. 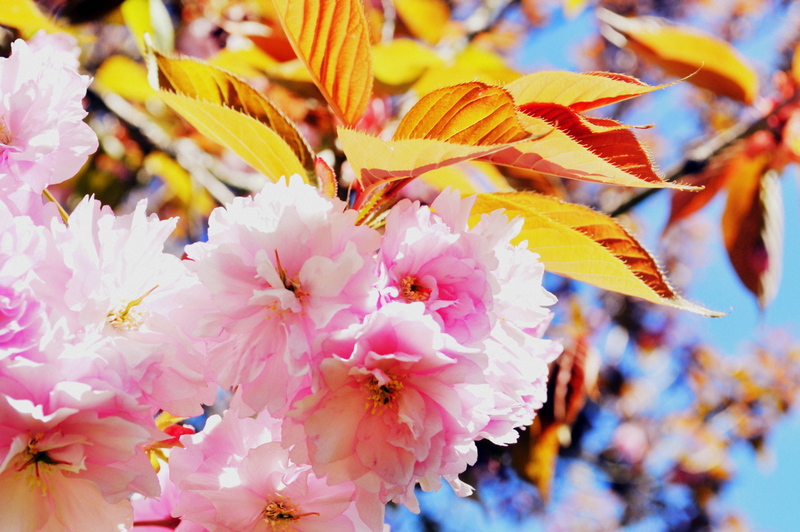 They were showing off all their finery in the spring sun. Gunnera is a spectacular herbaceous plant that loves a damp location and we managed to find two soggy spots in the garden for our plants to thrive. 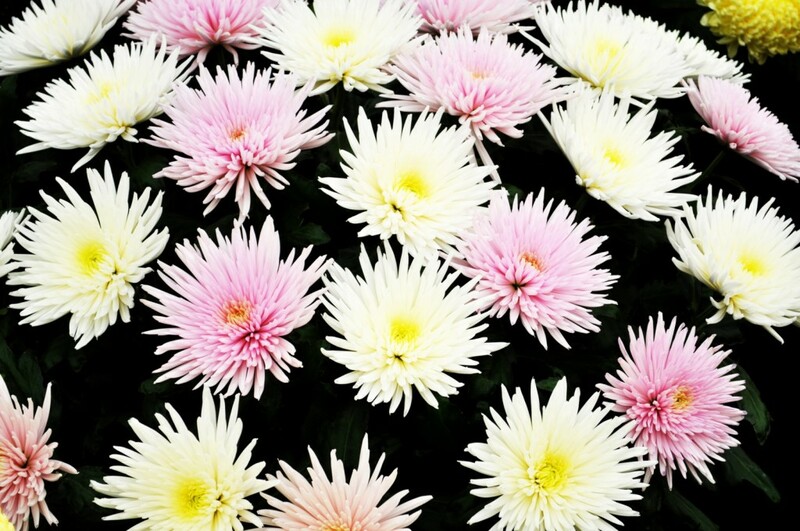 They were small plants when they were bought for a very special birthday, for a very special person, just two years ago, and they have established themselves very well. We now have great aspirations for them becoming monster attractions in our garden. 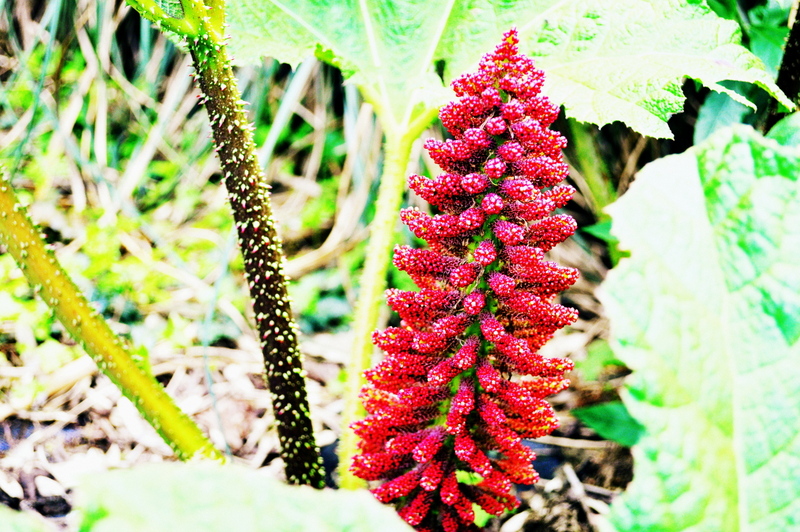 The brazen shock of red flowers, as seen above, compete for attention against the layers of sculptural green leaves. 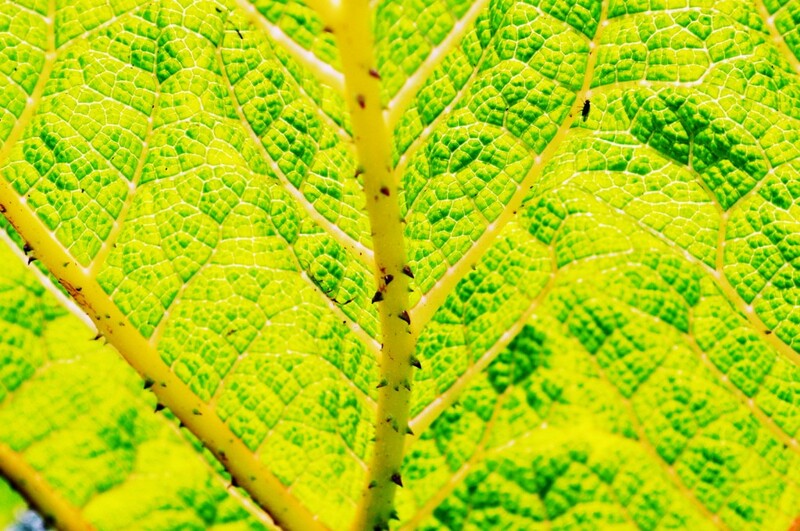 And, when the sun shines bright, the leaves become almost transparent creating a maze of intricate pattern, as seen below. Without my knowledge at the time, a cheeky fly just sneaked into the shot. I could not resist sharing the pictures of her delicious bakes with you, but and unfortunately, I cannot share the recipe with you. Clementine used a cookery book found buried amongst a pile of books in a stored box and to there it returned, before I was able to record its author. 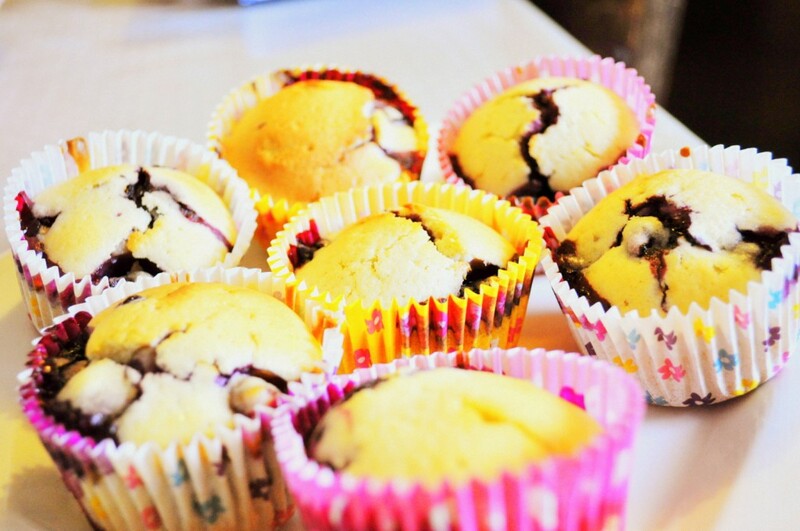 I do have my own muffin recipe though and I will share it with you very soon. I admit to not having made them for a while, so, I do feel that I should make a batch first to ensure that the recipe is as good as I remember. In the meantime, I do hope that you enjoy admiring Clementine’s efforts. During the making process an abstract art form was created with the olive oil and sugar combination. 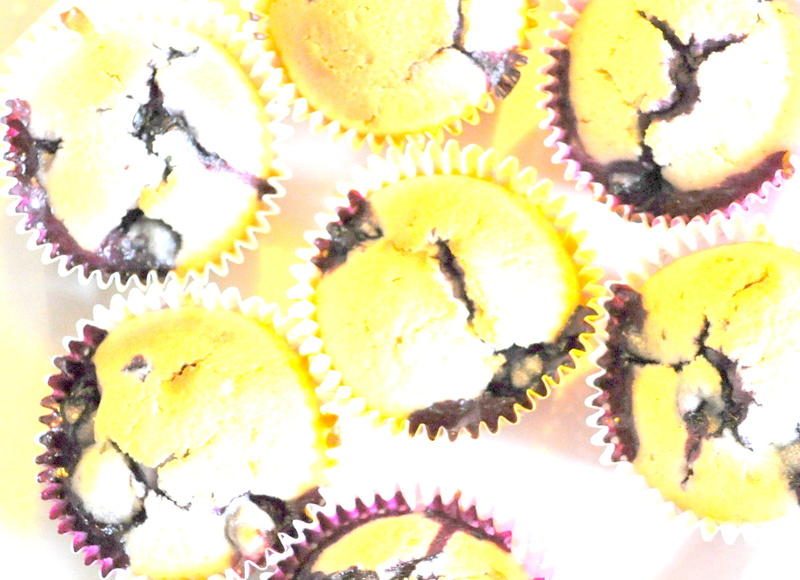 When they were baking the blueberries bubbled through the golden batter creating a wonderful marble design. Not only are blueberries packed full of nutritional benefits, but they are pretty colourful too! I can never resist turning something simple like a plate of Clementine’s blueberry muffin bake into a colourful picture. However they were for eating and eat we did. Delicious when still warm and unadorned or dressed up with cream or ice cream; great with yogurt too, so my youngest informs me. My eldest quite enjoyed hers with custard. Muffins fit well into a snack box, picnic hamper and the palm of your hand, so, they can be enjoyed anywhere and anytime. 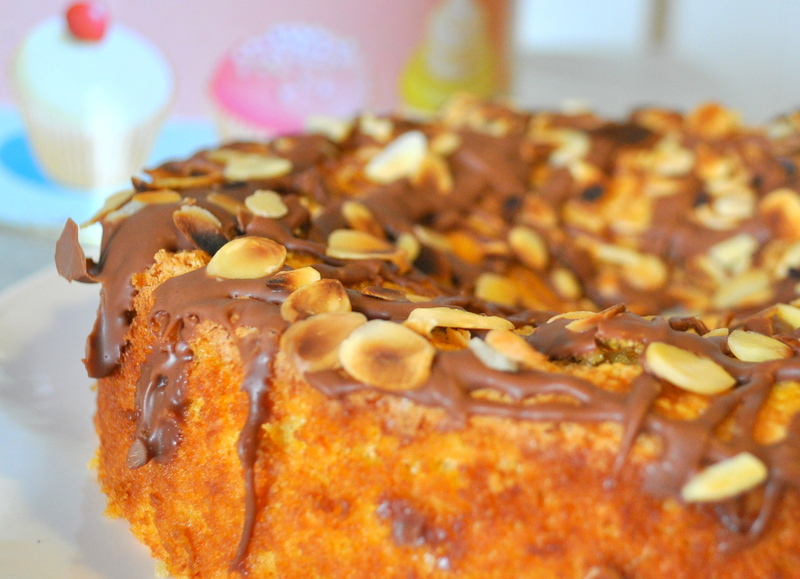 A DELICIOUSLY MOIST CAKE THAT COULD ALSO BE A PUDDING AND DESERVES A PLACE ON EVERY TABLE! I have not yet come across anyone who does not like this cake, quite a statement but it is true.It is a bake that can be presented for many occasions; an afternoon treat for when the kids come home from school, a birthday surprise for someone special, a great dessert with a dollop of cream for a wonderful dinner party finale, or out in the garden for summer tea with a scoop or two of ice cream. 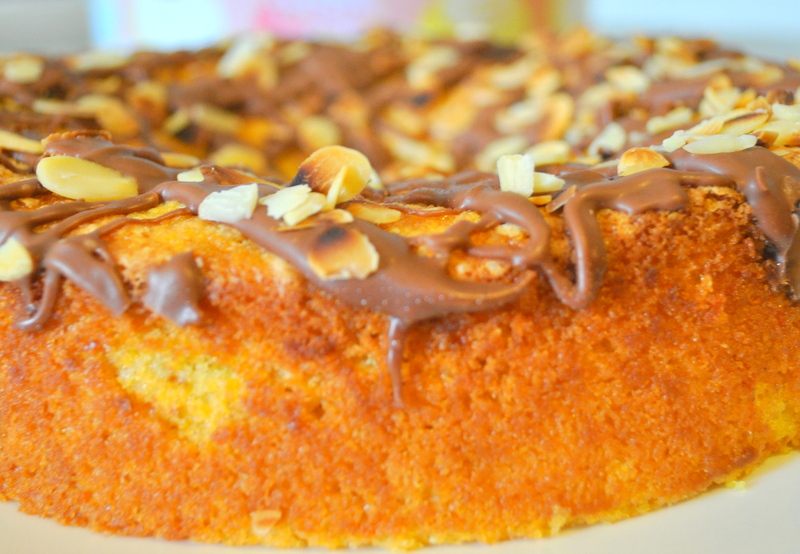 The longer it is baked the more cakey it becomes; accordingly the less it is baked the more torte like it becomes and will subsequently create a well in which the cream can puddle. And what is the trick that makes it so moreish? 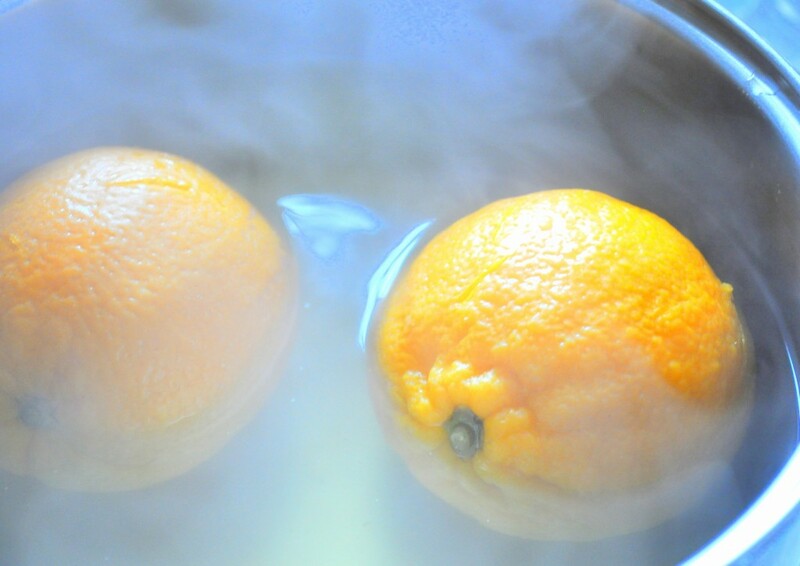 The boiling of the orange. Pre-heat the oven to 180°C (160°C fan oven) mark 4. 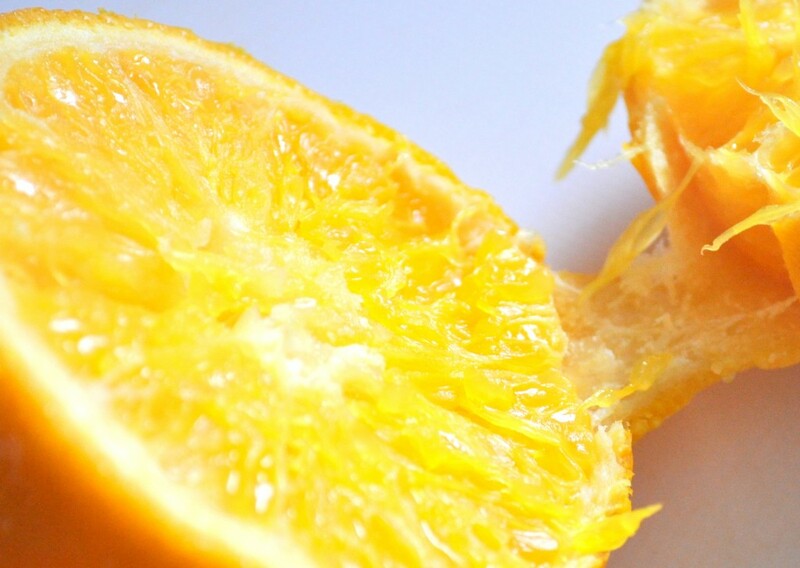 Put the whole orange, that is right, every bit of the orange goes into a saucepan and is covered with water. Bring to the boil and simmer for at least one hour. It should be very soft when a knife is inserted. Remove from the heat and allow to cool. When cooled cut in half and remove any pips and place all, peel, pith and flesh of the orange into a blender or food processor and whiz to make a smooth puree. Now, or you could do this whilst the orange is cooling, place the eggs and sugar in a bowl and whisk together until thick and creamy, about 5 minutes with an electric mixer. Next fold in the almonds, flour and baking powder, followed by the orange puree. 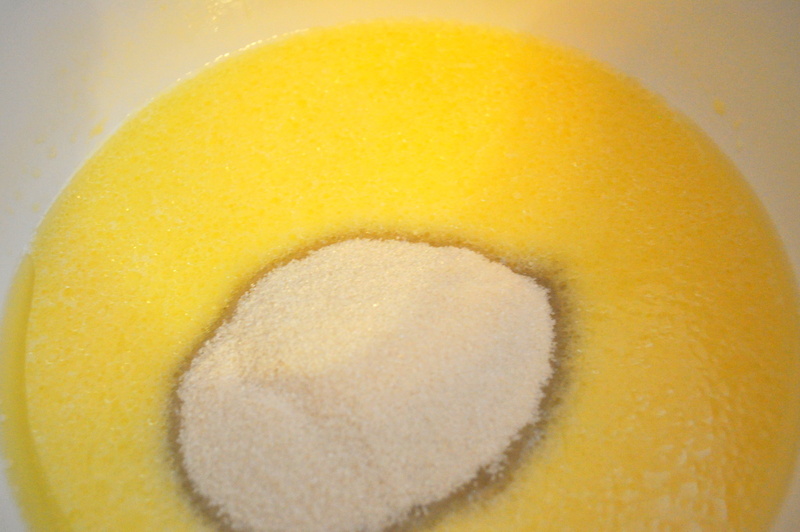 Spoon the cake mixture into the prepared cake tin and bake for approximately 40 minutes. The cake should be springy to the touch and a skewer, when inserted, should come out clean. Leave in slightly longer for the bake to be more like a cake. In this instance it will have visibly risen more and be firmer to the touch and the skewer will come out dry. Leave the cake in the tin to cool. Whilst the cake cools break the chocolate into a small heatproof bowl and place it over a pan of gently simmering water until the chocolate has melted. Spread the flaked almonds on a baking tray and pop under a grill until lightly golden, or darker if you prefer a more toasty flavour. 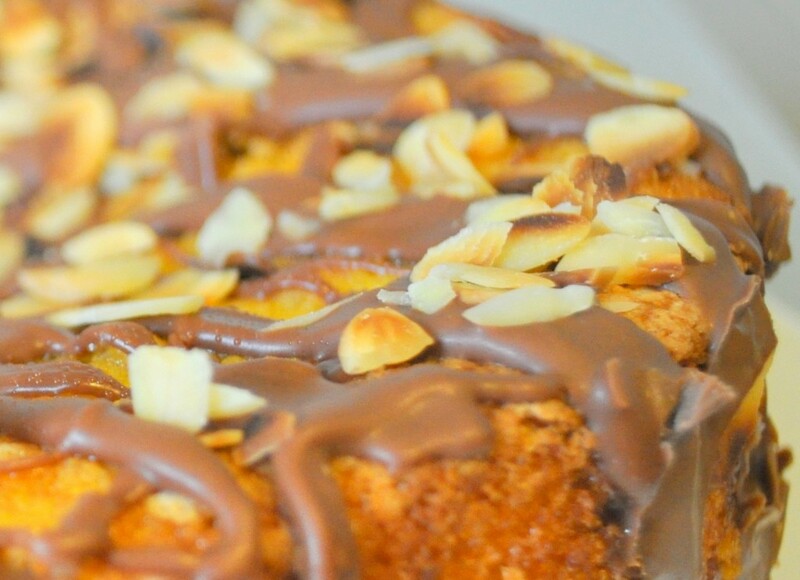 Once the cake has cooled remove carefully from the tin and place onto a serving plate, drizzle over the cake to make your desired pattern and scatter the flaked almonds over to set into the chocolate as it hardens. You can either serve this immediately, in which case the chocolate will be softer and more like a sauce, in fact you could serve it with a chocolate sauce rather than coat the cake with chocolate and then scatter the almonds over the top and serve with ice cream, or allow the chocolate to set for eating later, unless the temptation is too great and it is devoured in the meantime! But, if you do need to keep it, it keeps very well in a cake tin for up to a week. It can be kept in the fridge for longer and freezes very well, just remember to thaw it thoroughly before consuming.